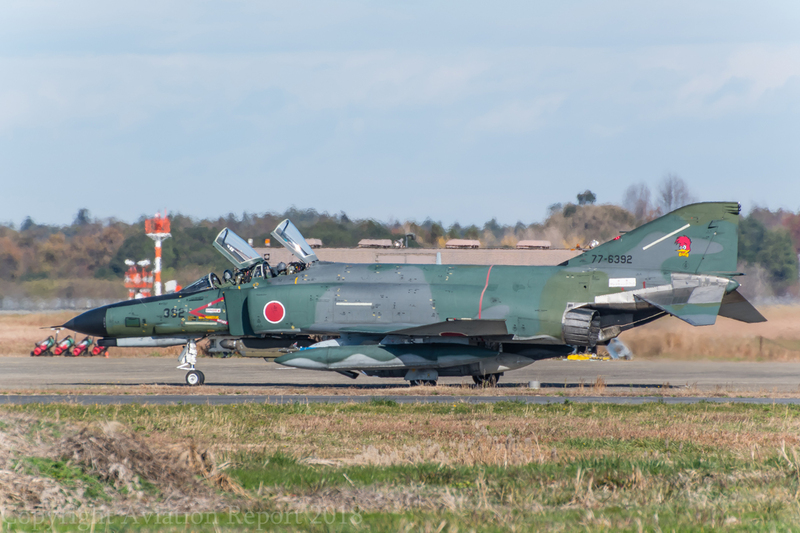 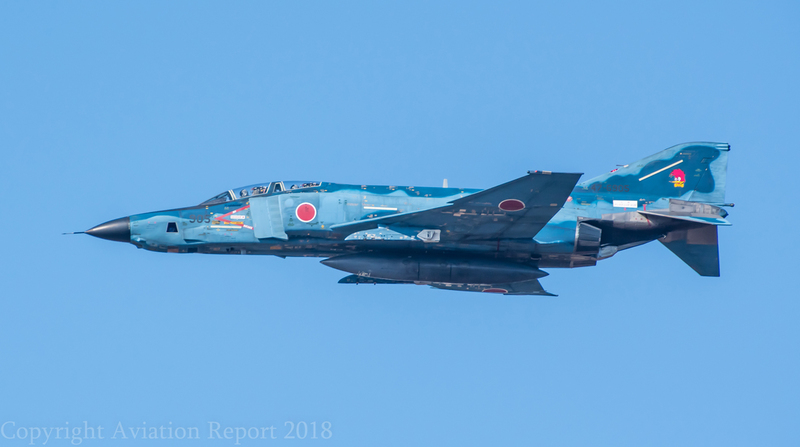 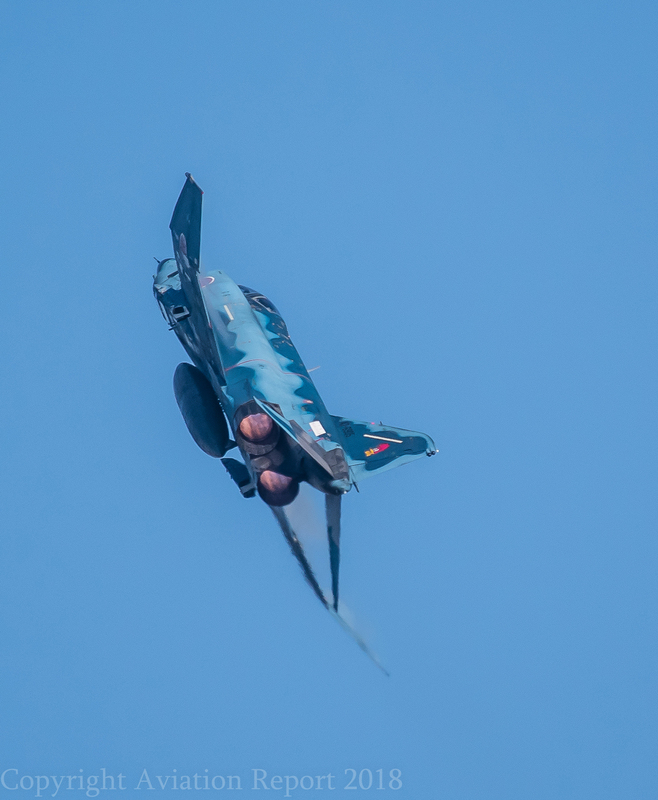 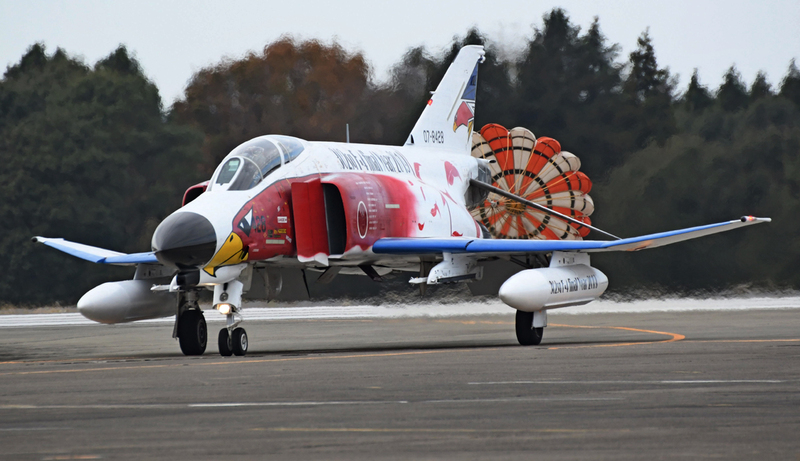 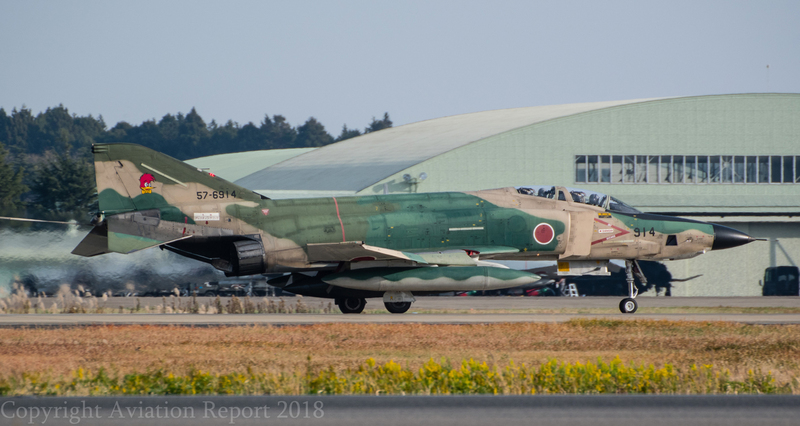 JASDF's two operational F-4EJKai tactical fighter Hikotai of the 7th Kokudan (Air Wing) are based at Hyakuri with the Central Air Defense Force along with RF-4Kai (reconnaissance nose) and RF-4EJ (carrying ventral podded reconnaissance equipment) of Teisatsu Kokutai (Air Reconnaisance Group). 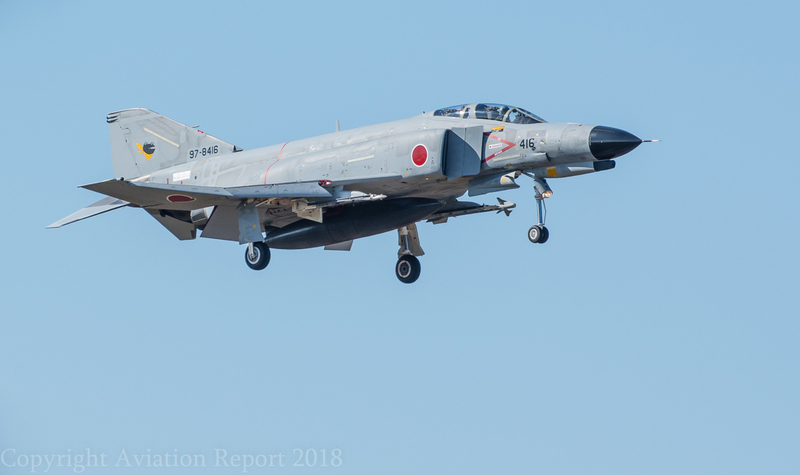 The 301st Hikotai is the "frog-and-scarf" - taken from the Shirokuno Gama Frog which inhabits Mount Tsukuba, close to Hyakuri Air Base), observant spotters noted the 301st's frog's scarf currently shows the seven stars of the 7th Kokudan. 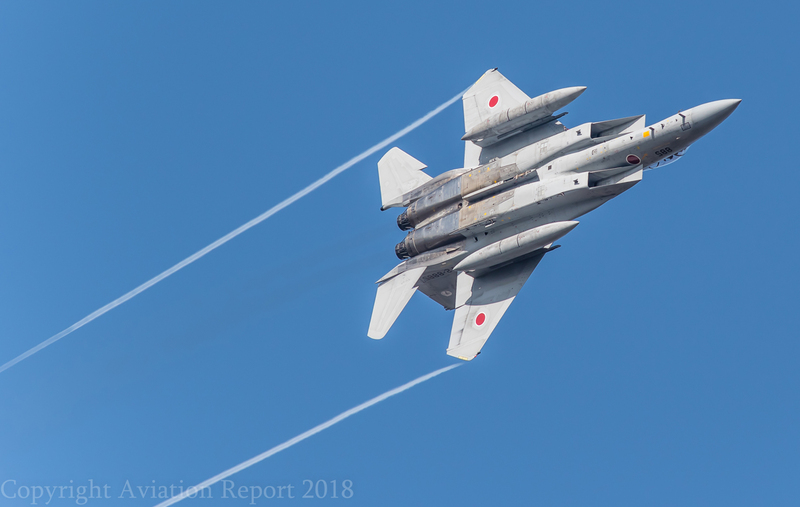 The 302nd Hikotai "white-tailed Eagle" - the stylised white-tailed eagle represents the Ojiro Washi Eagle which inhabits the mountains near their original base at Chitose). 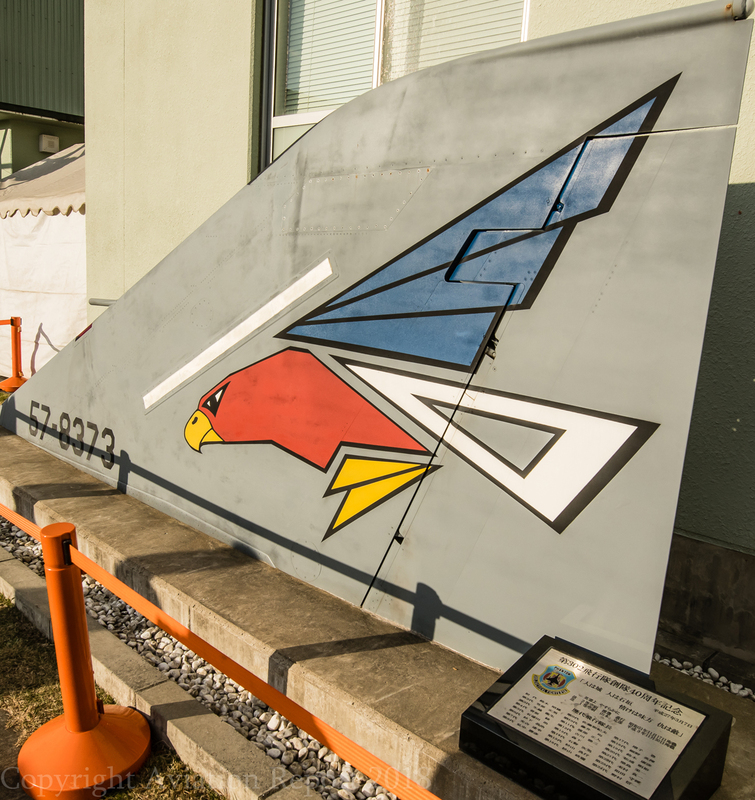 501st (Teisatsu Kokutai or Tactical Reconnaissance) Squadron "Woody Woodpecker". 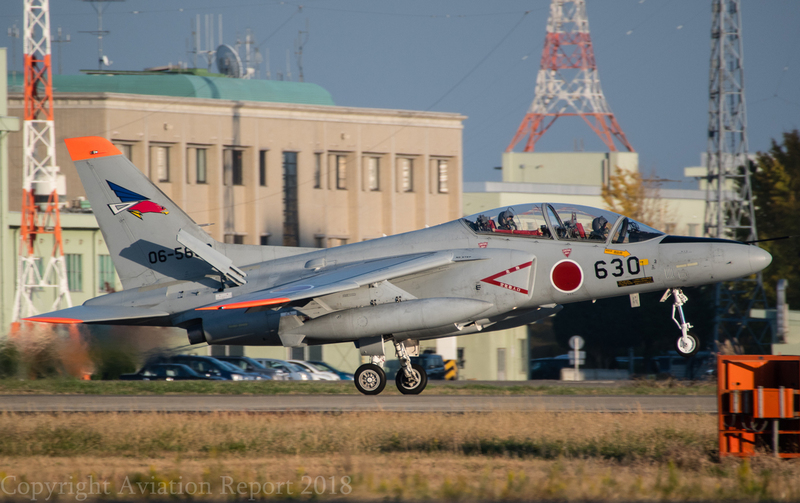 As seen in the accompanying images, the 301st and 302nd Hikotai currently contribute to the QRA - Quick Reaction Alert which maintains interceptor coverage for Japan and the Tokyo area in particular. 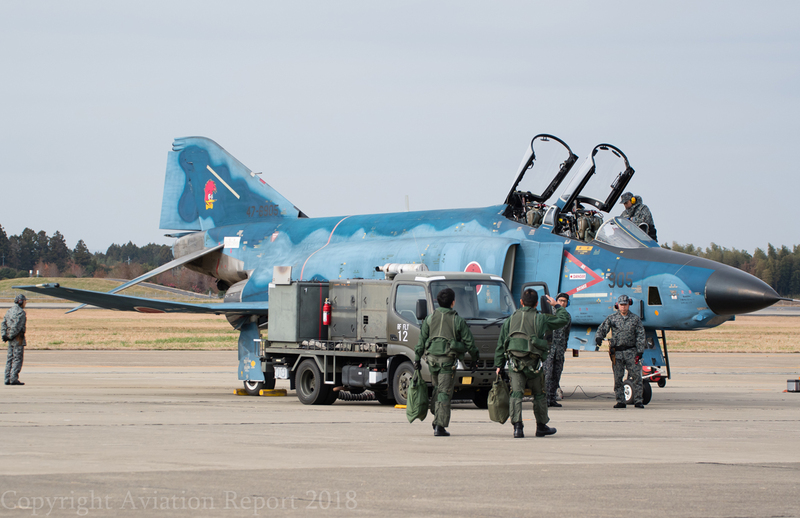 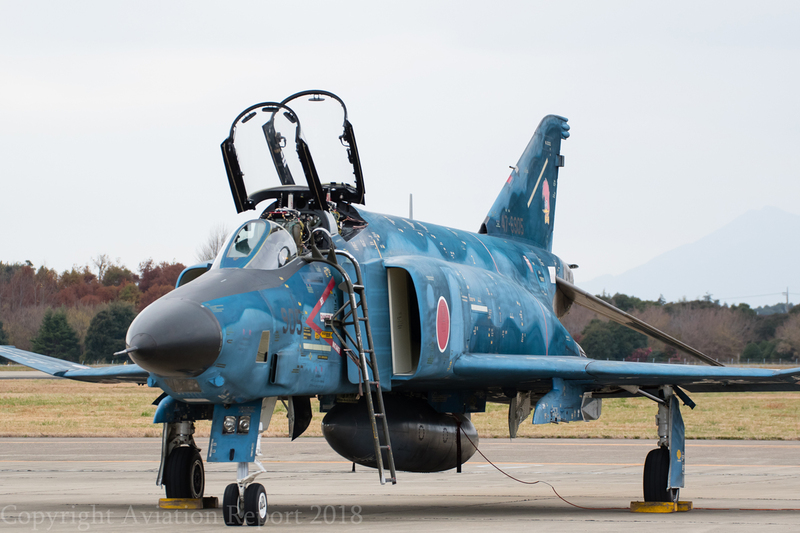 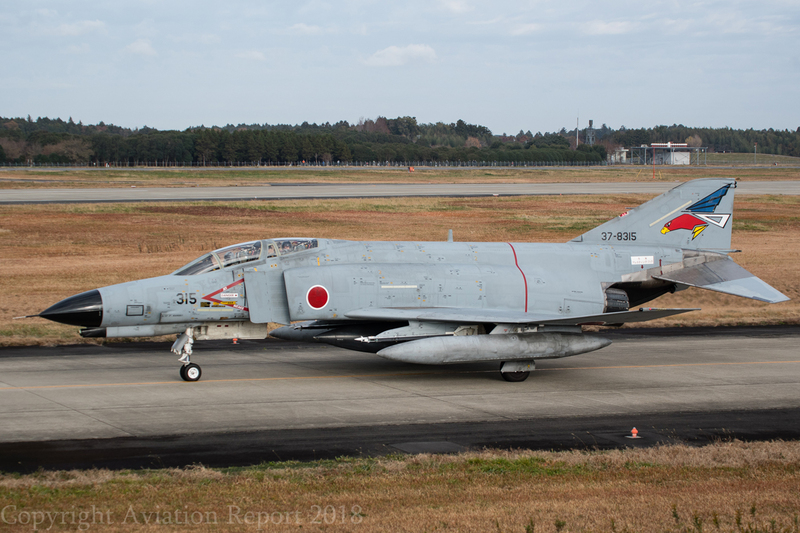 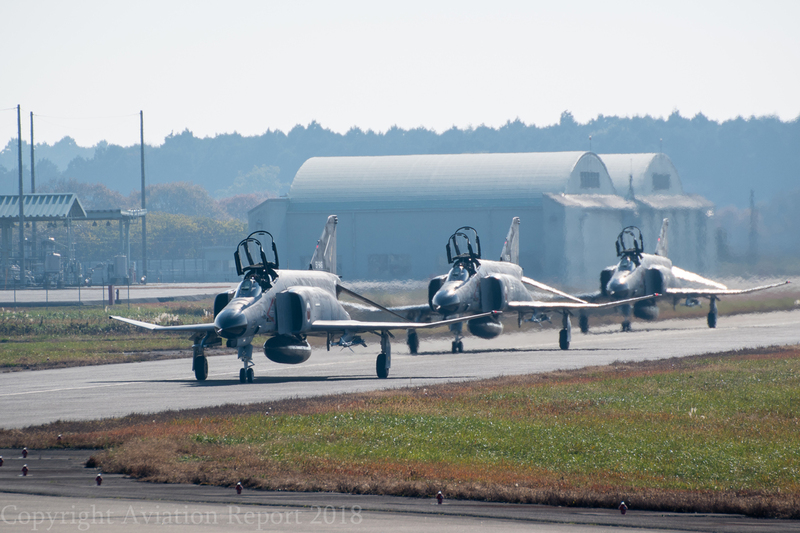 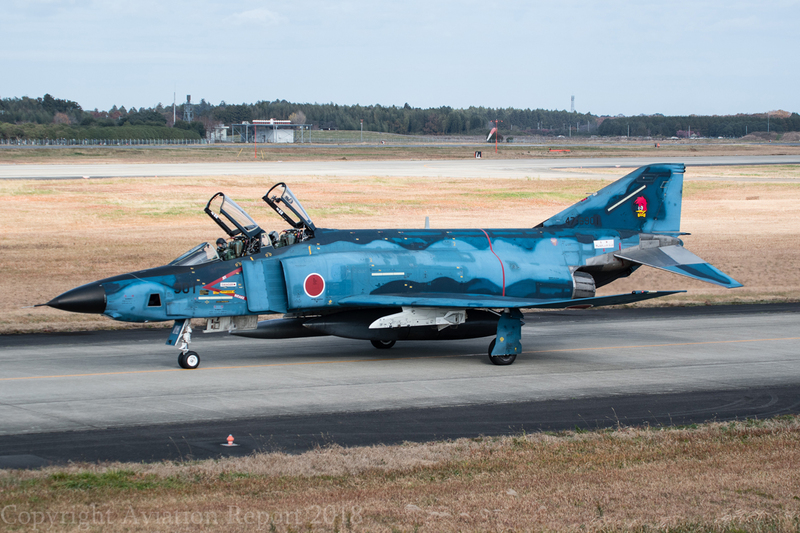 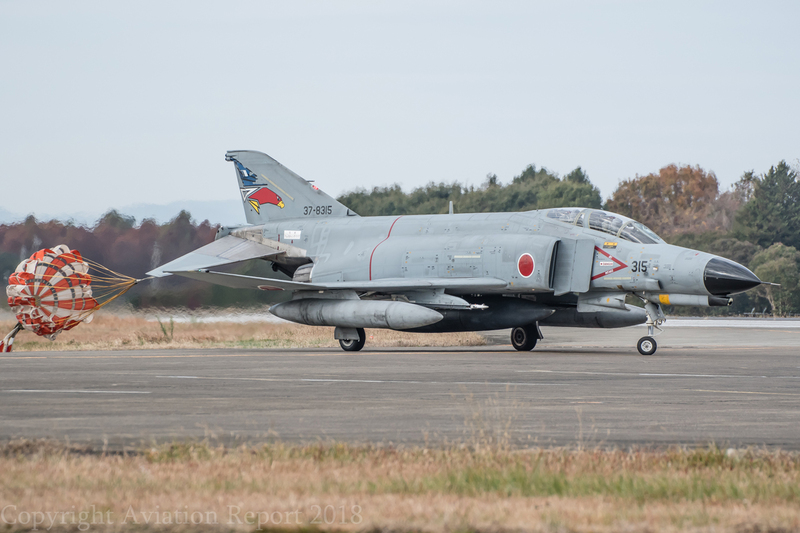 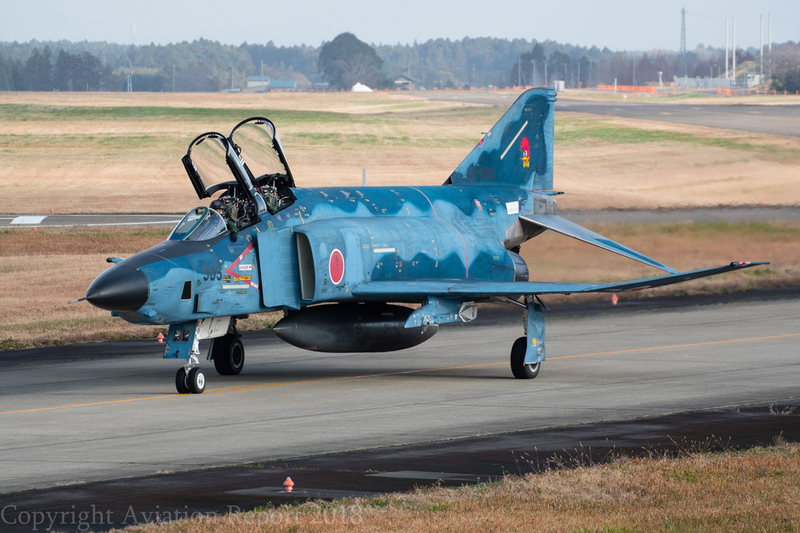 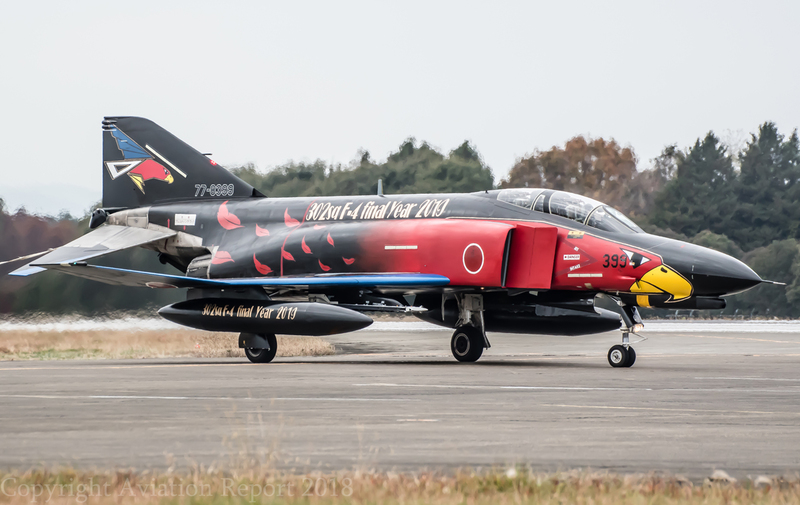 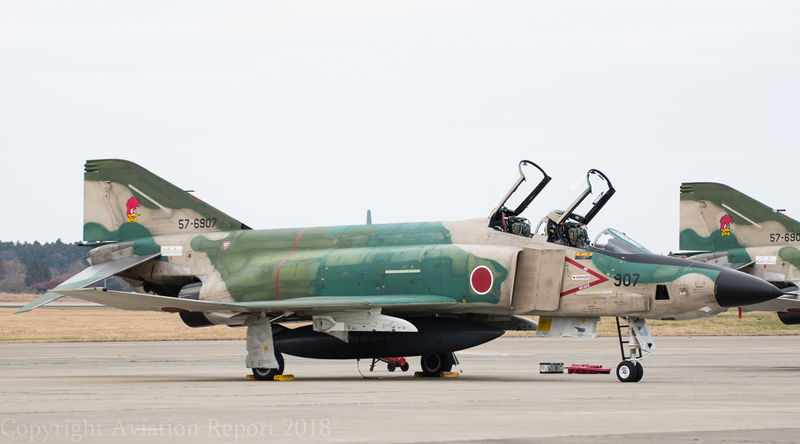 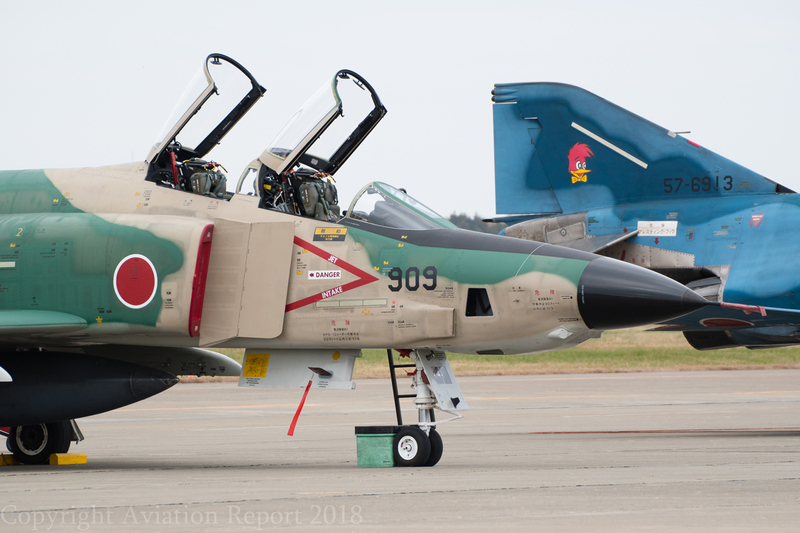 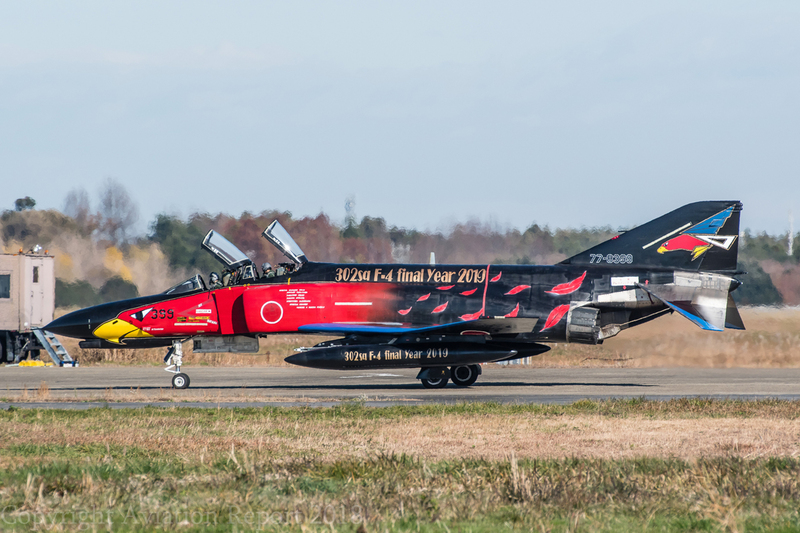 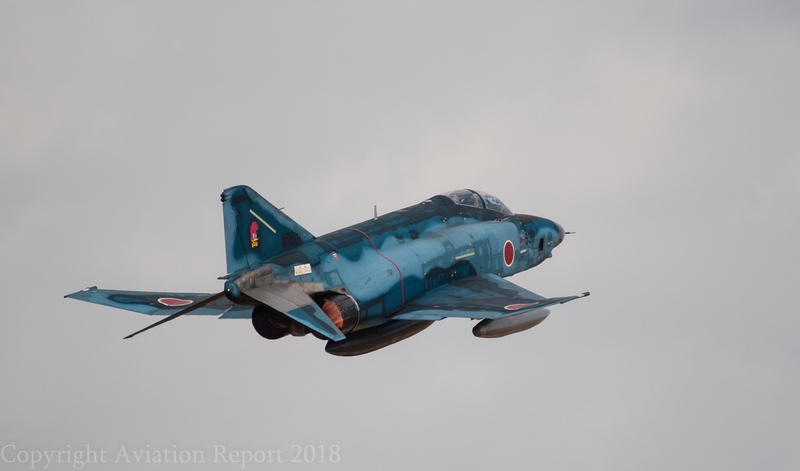 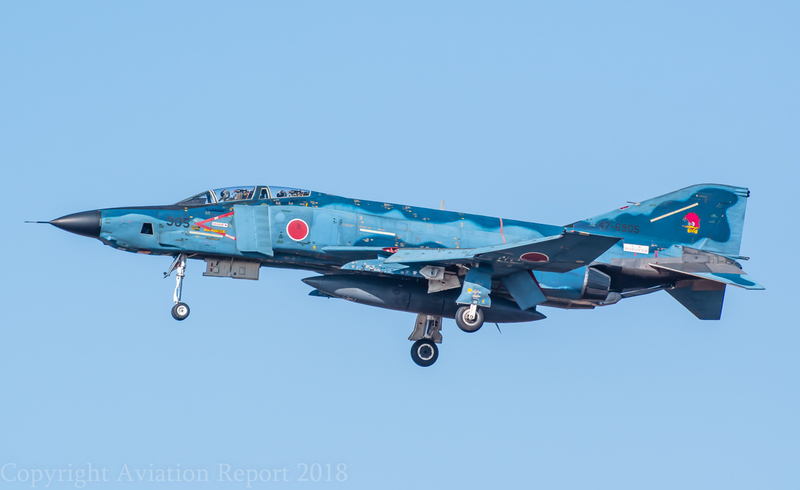 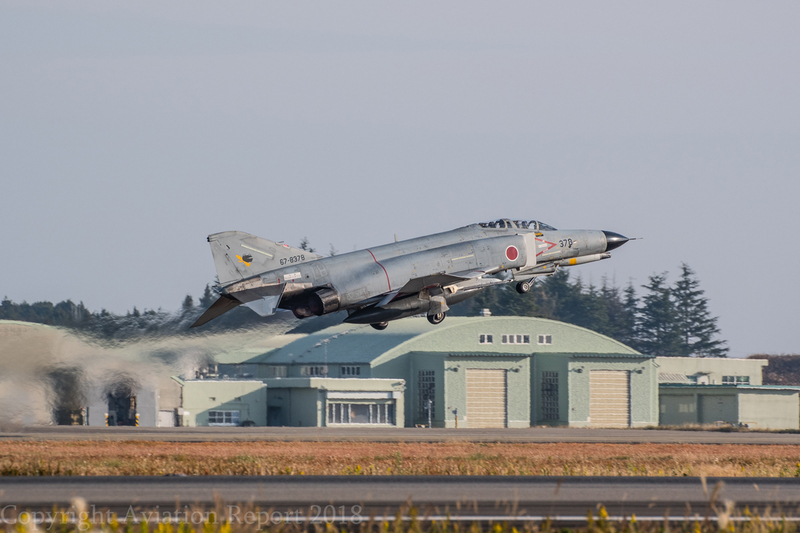 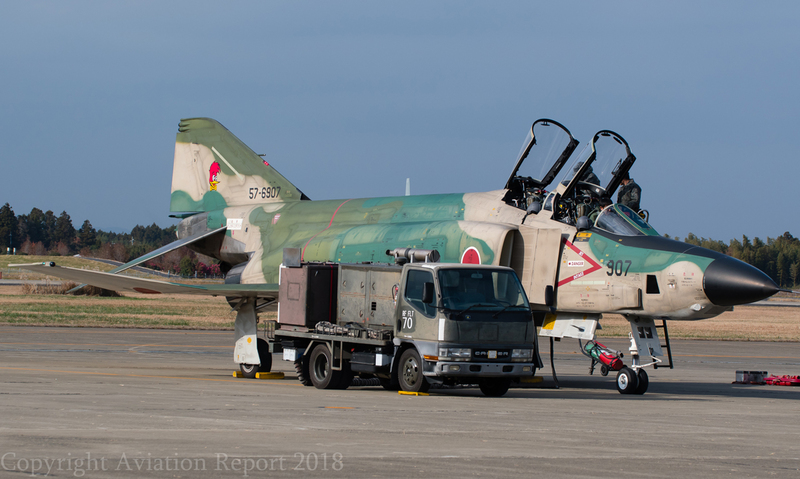 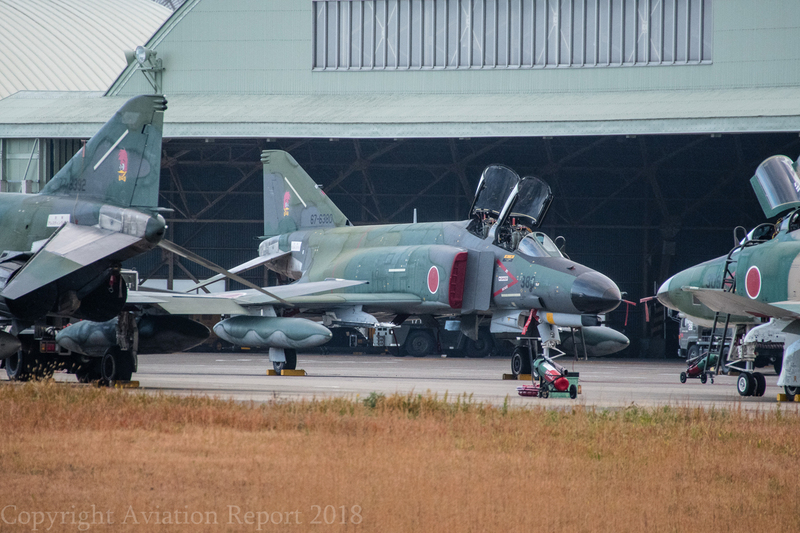 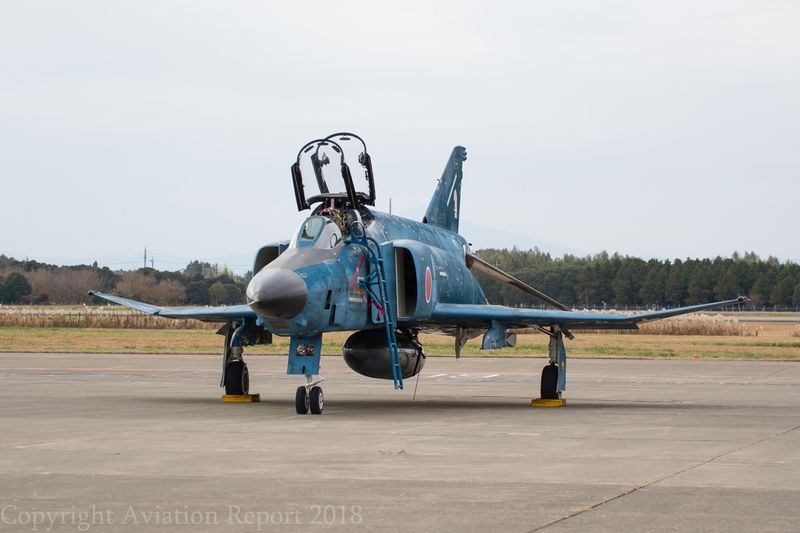 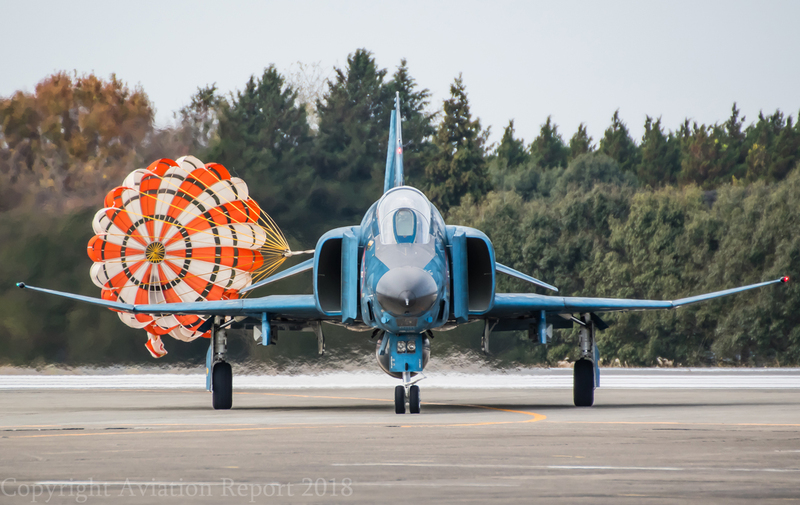 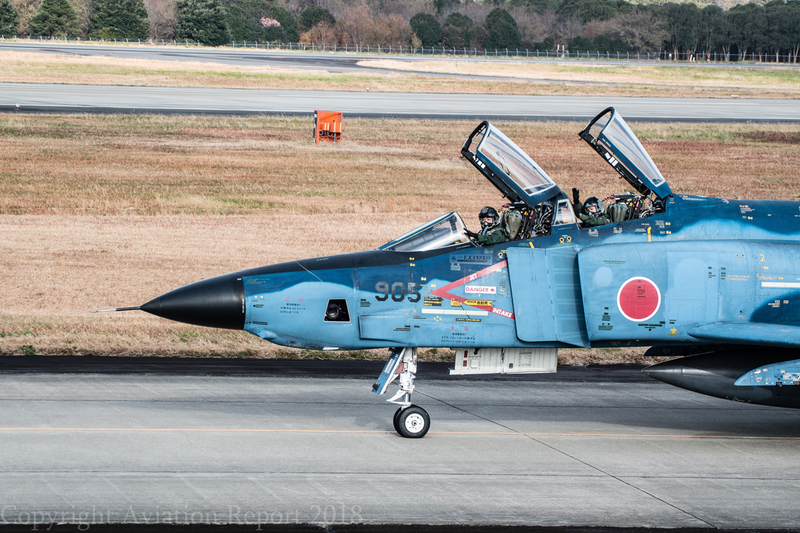 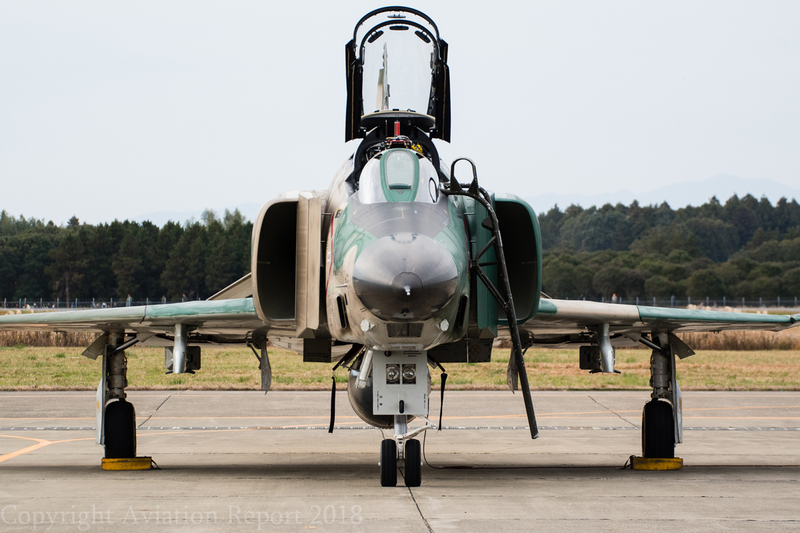 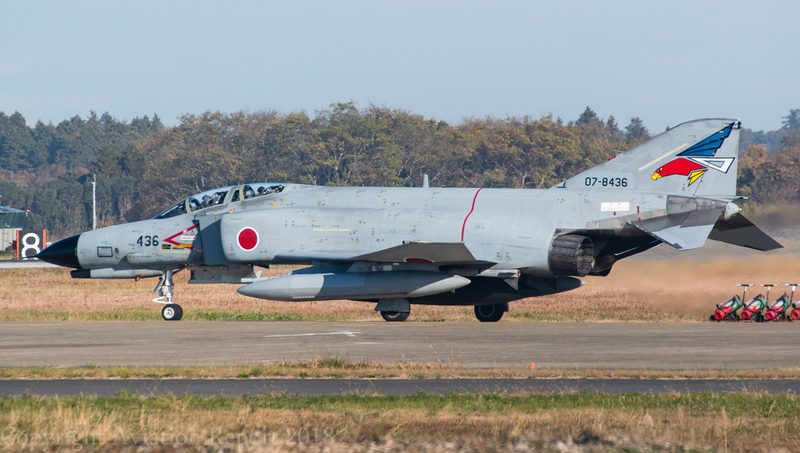 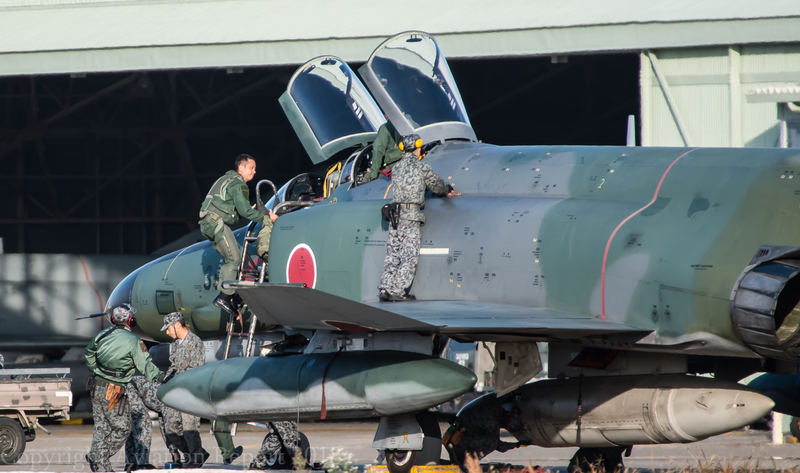 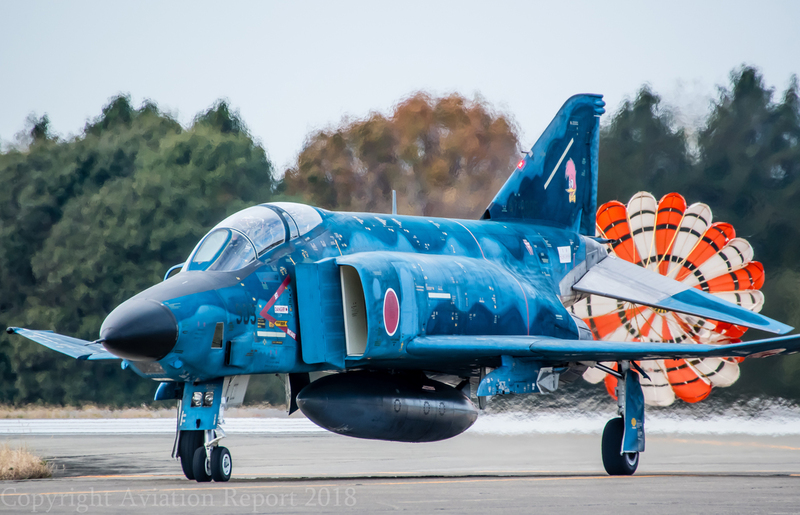 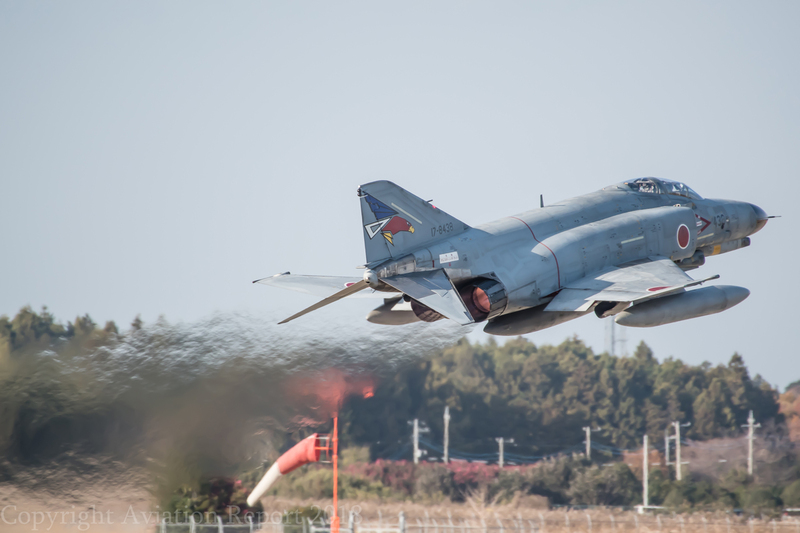 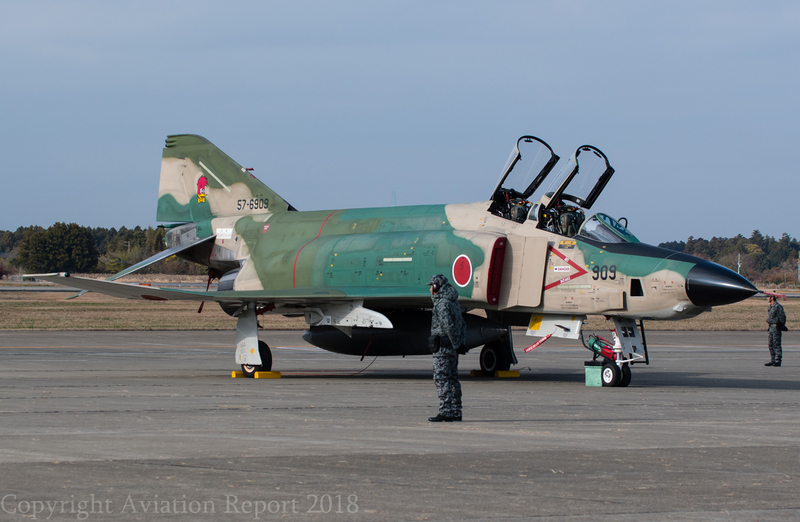 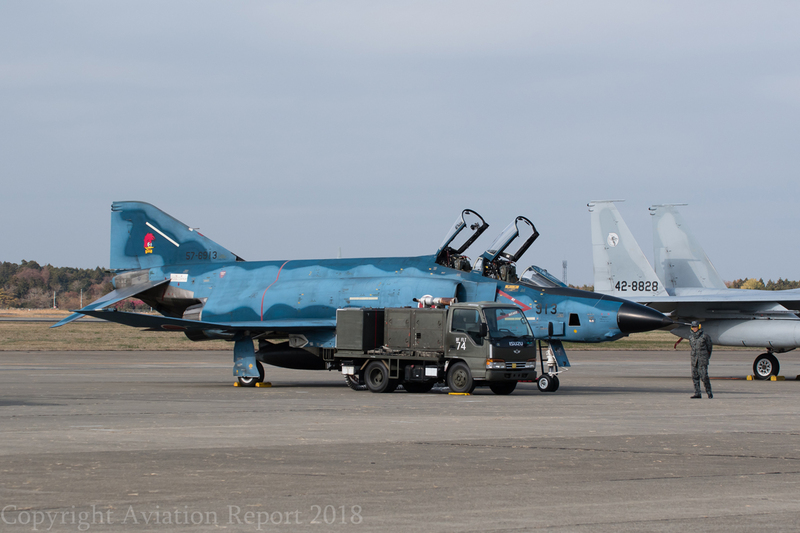 F-4EJKai continue in use at Hyakuri as the 302nd prepare for their retirement of the type, the 301st with their F-4 Tactical Fighters and the 501st continue to operate the RF-4 variants until replaced by newer jets. 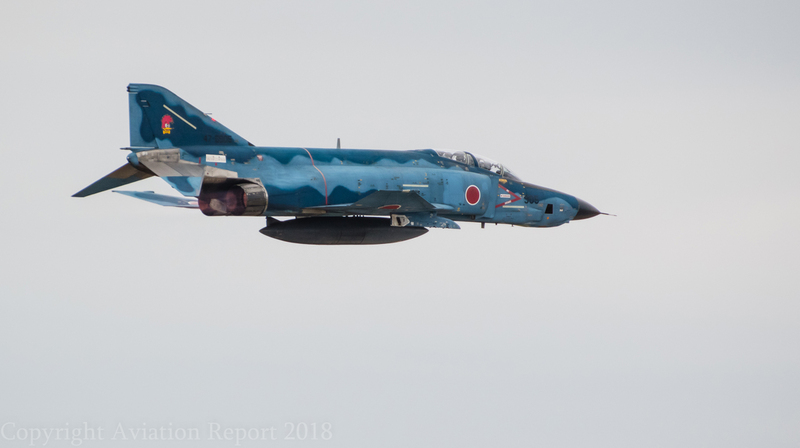 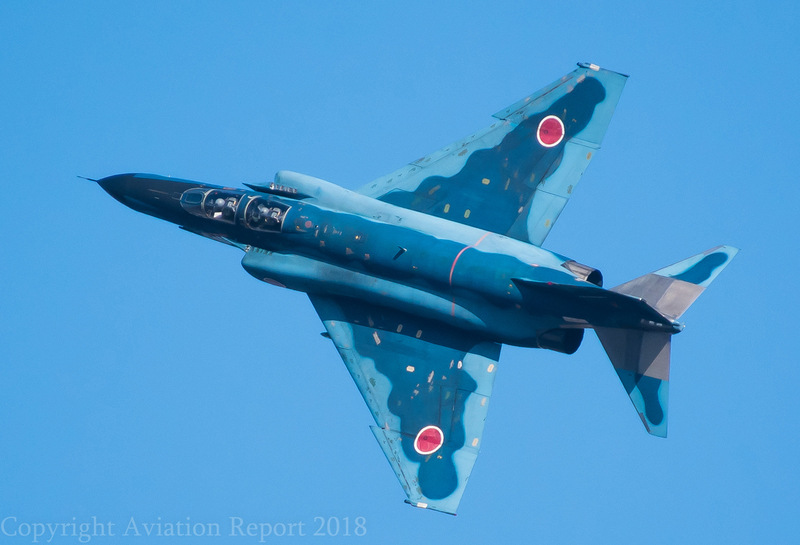 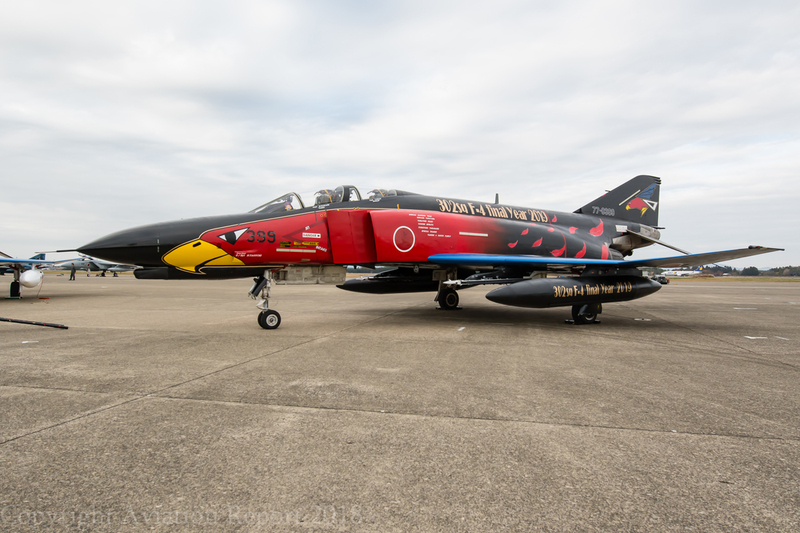 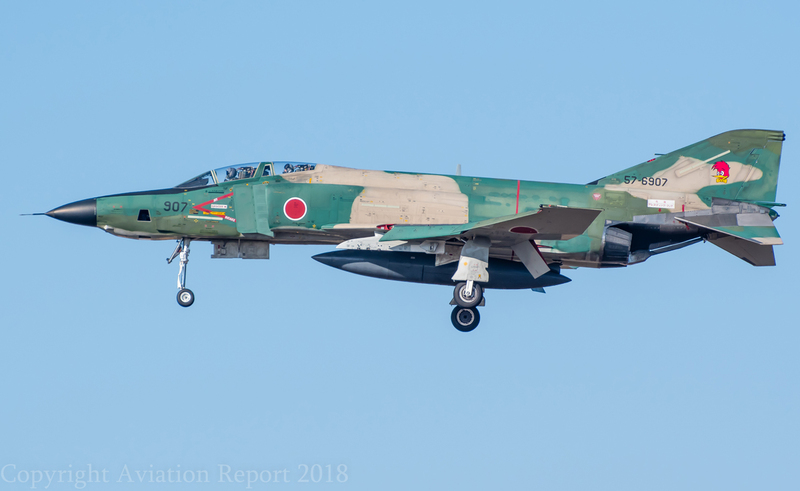 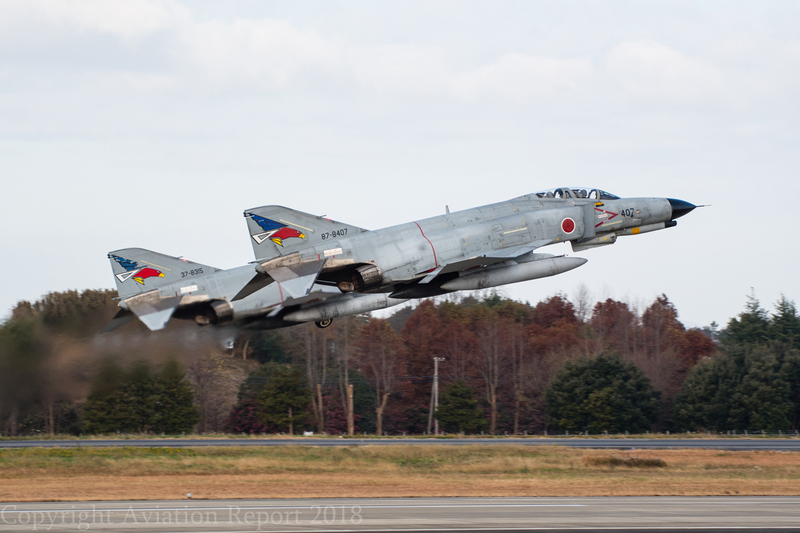 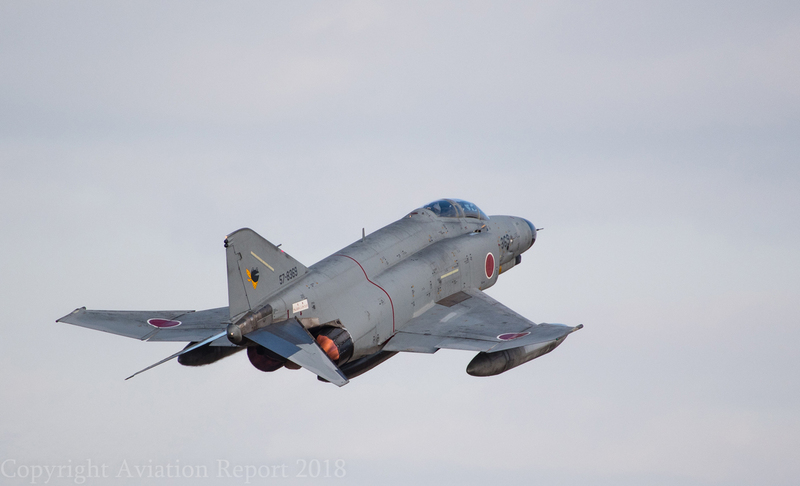 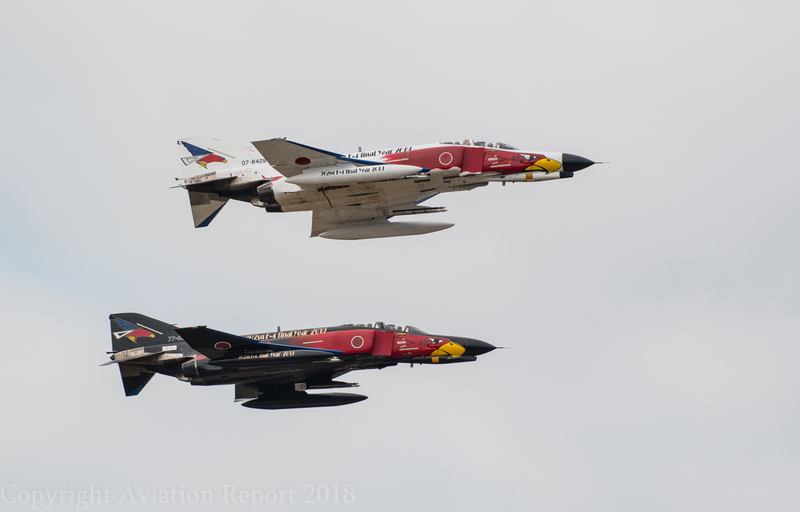 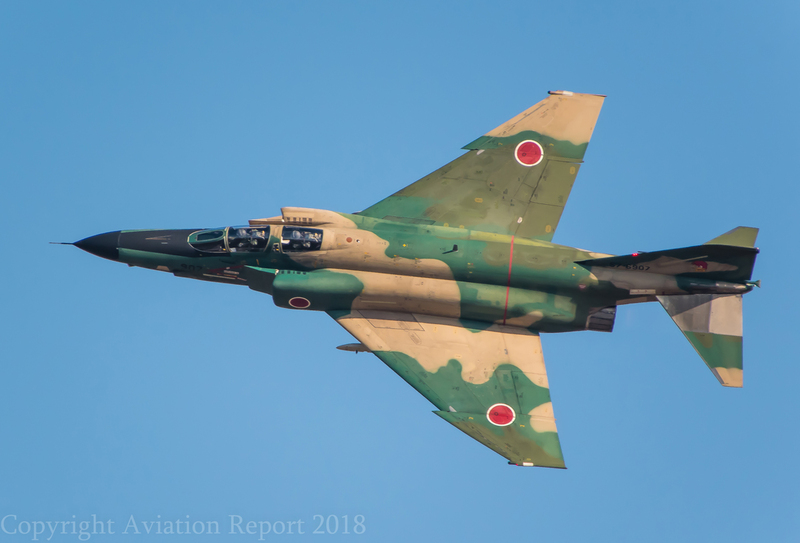 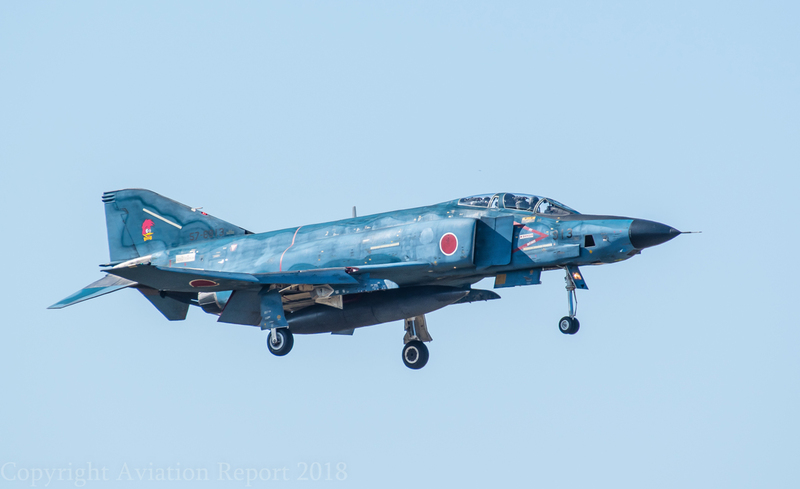 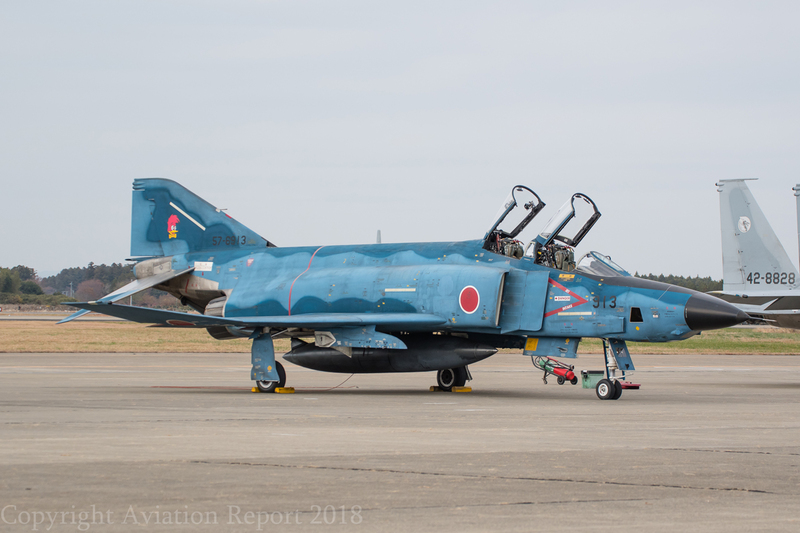 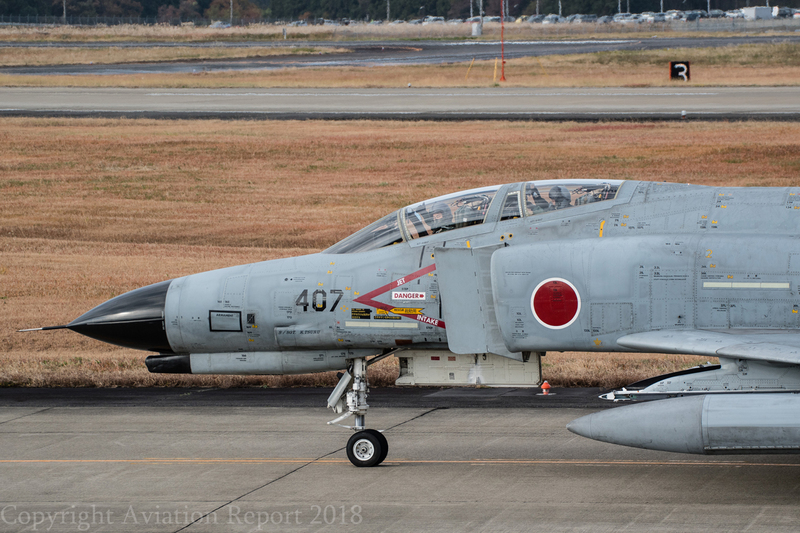 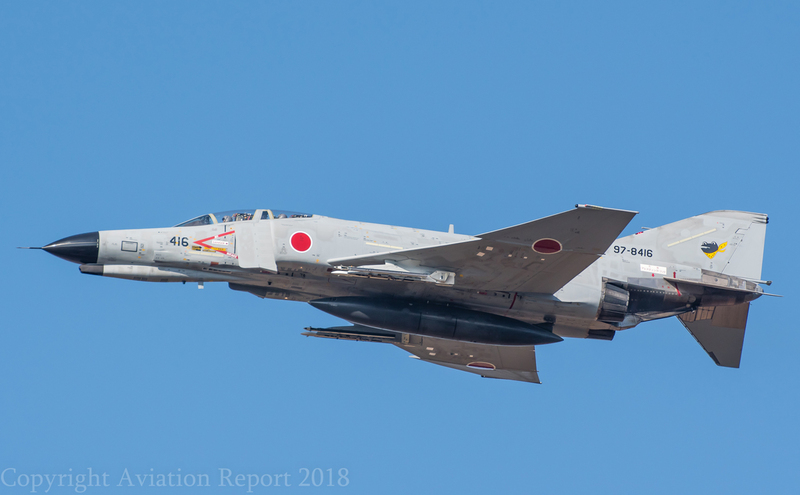 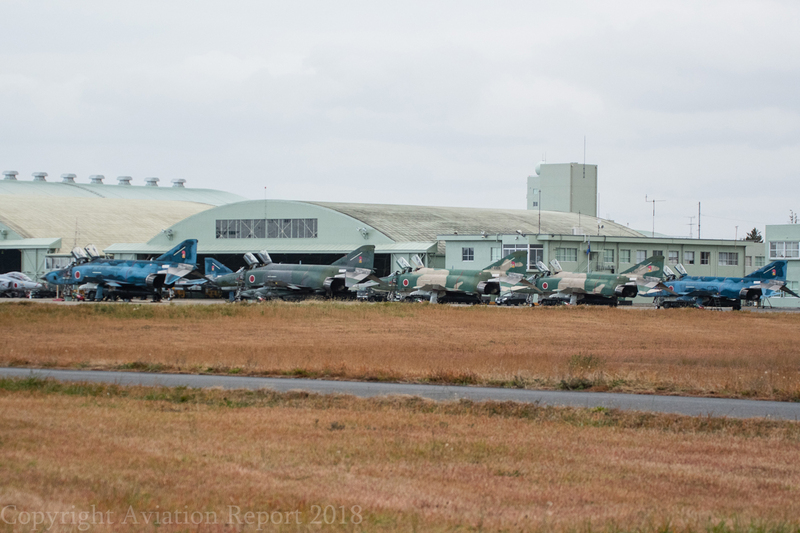 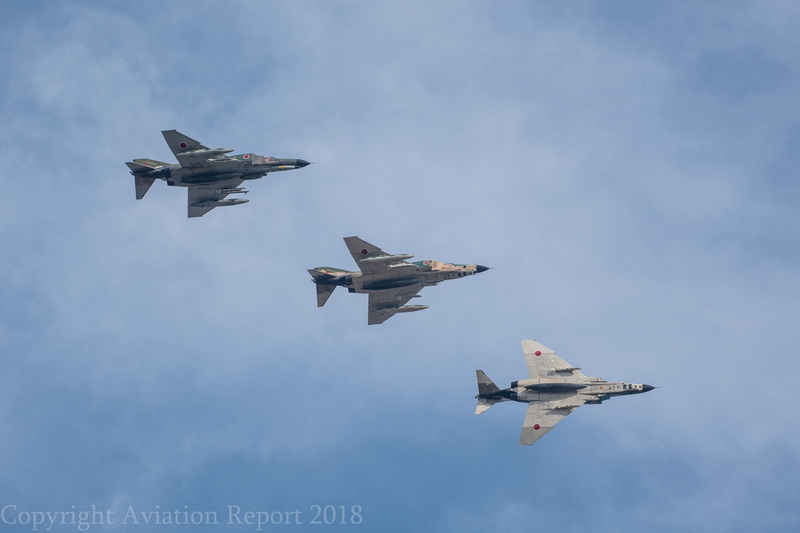 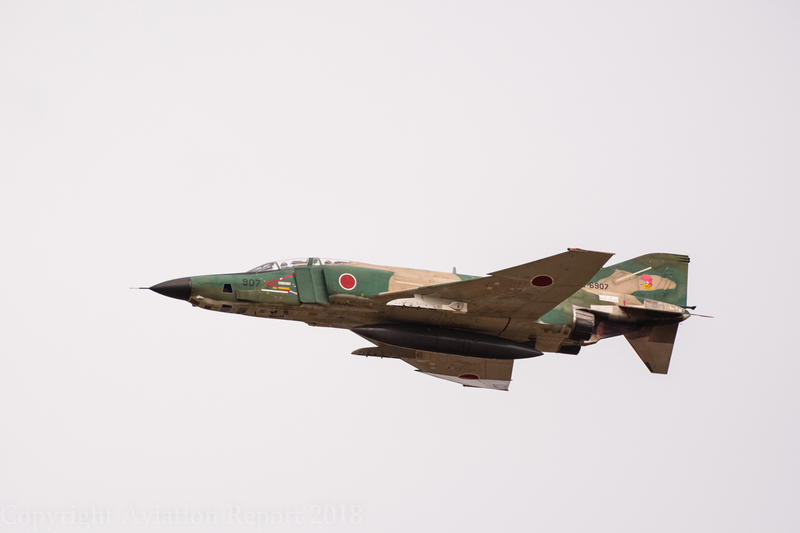 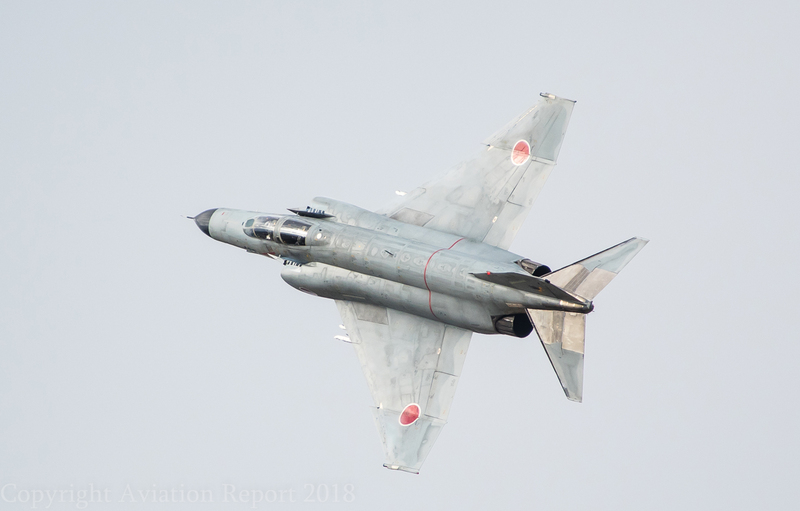 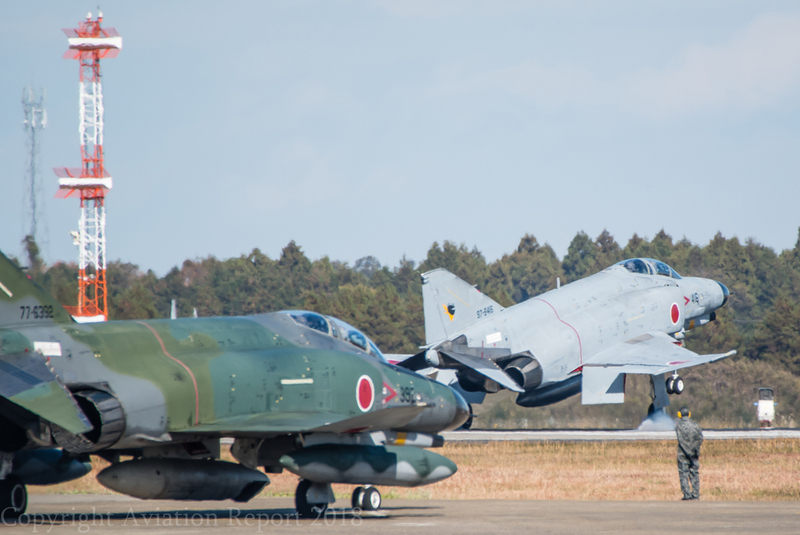 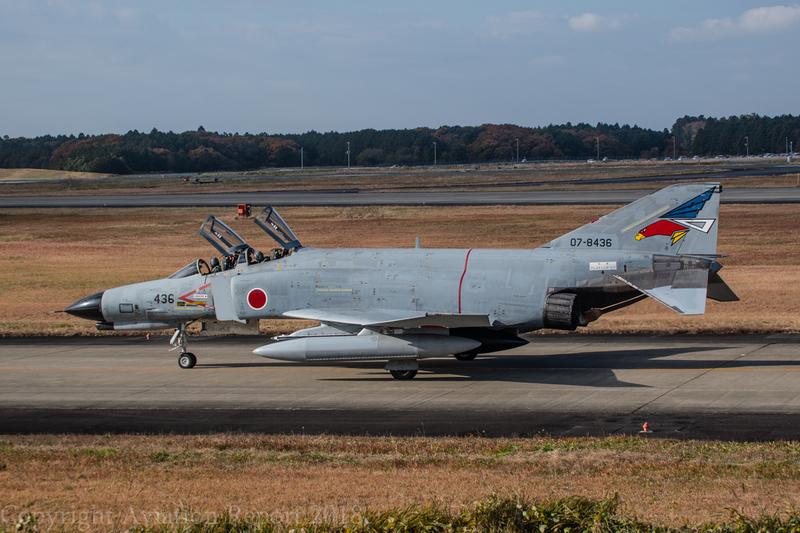 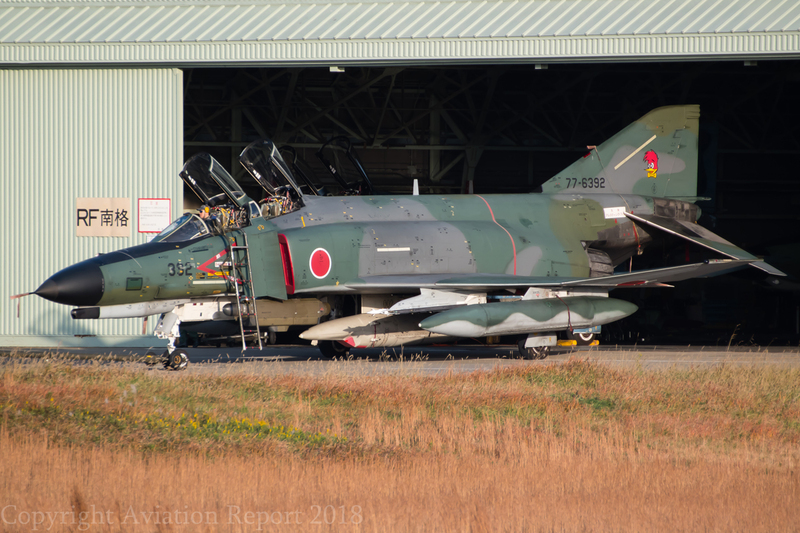 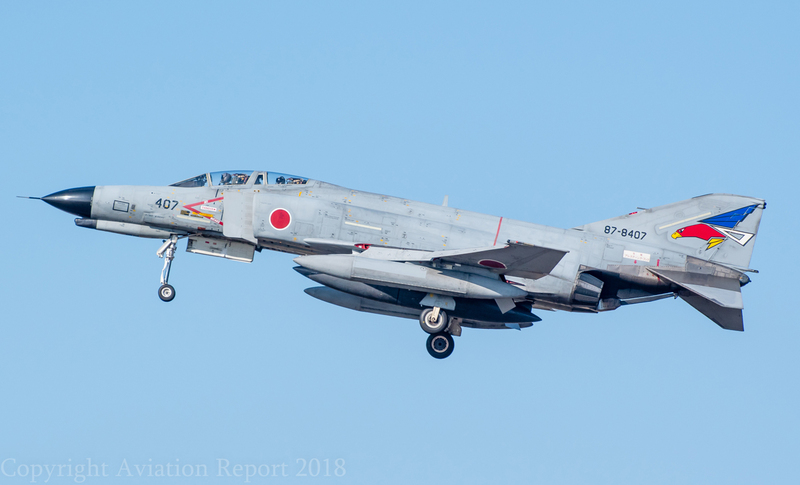 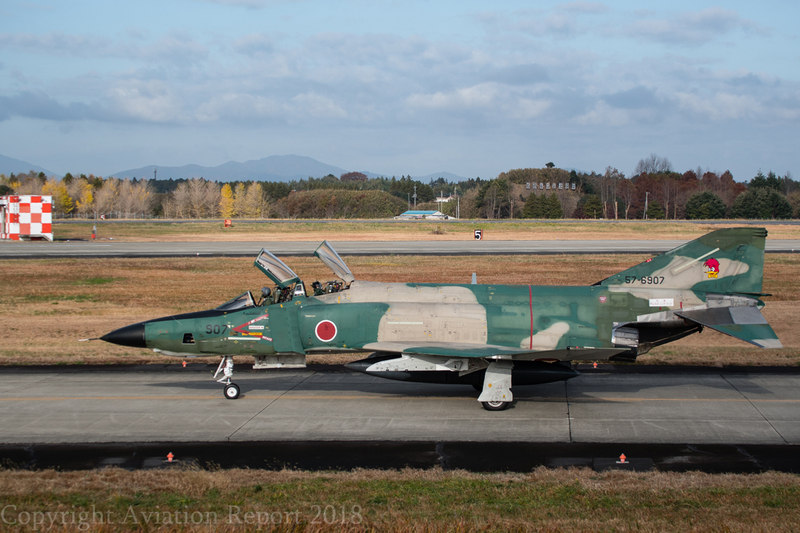 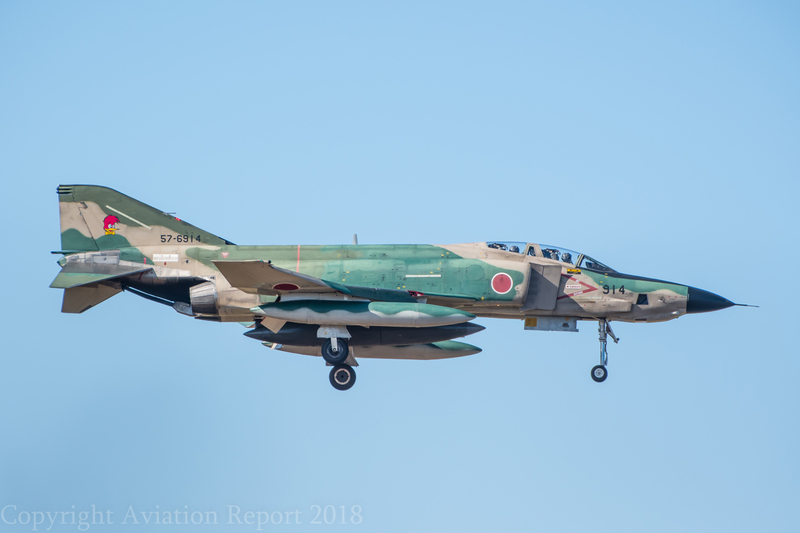 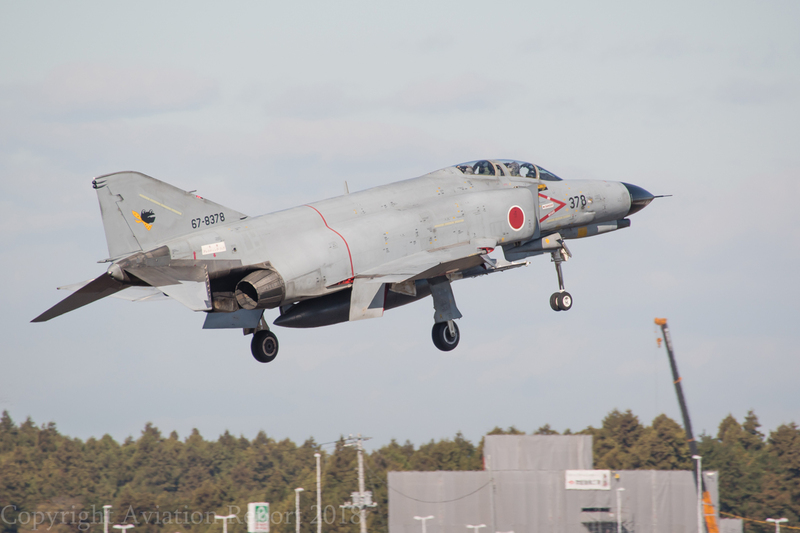 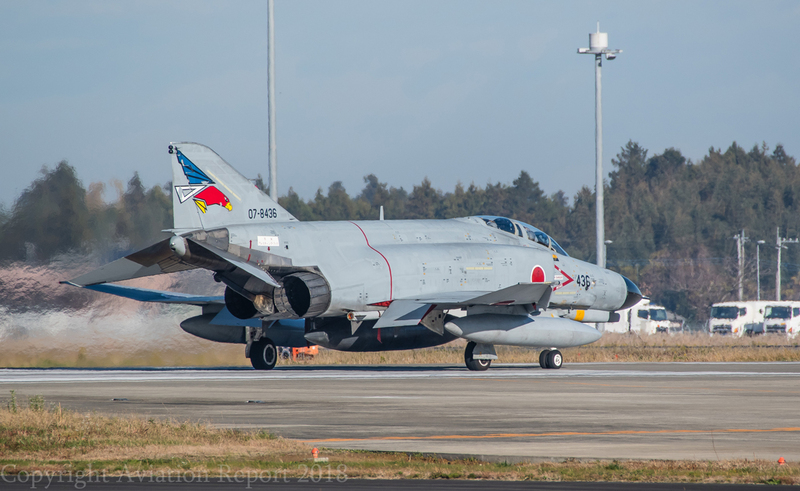 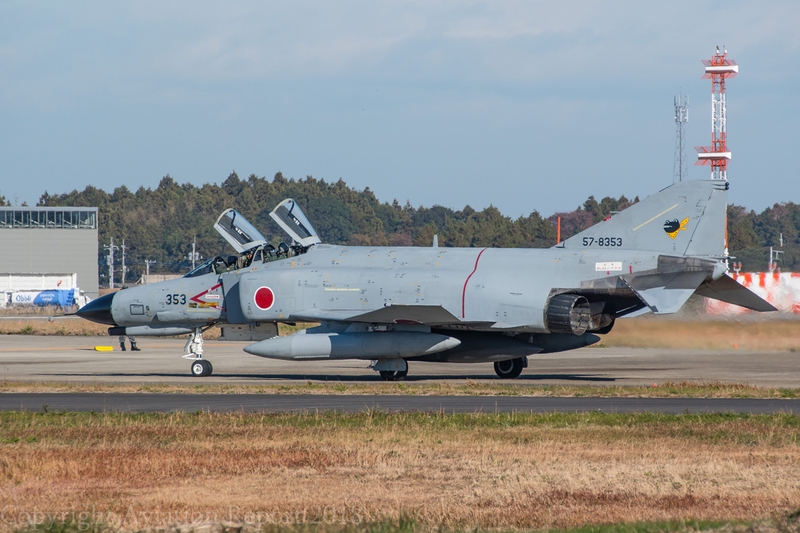 late news from Stars and Stripes - The Japan Air Self-Defense Force will retire its aging RF-4E Phantom II reconnaissance jets and decommission the unit that flies them by March 2020, the Defense Ministry is planning to replace the Tactical Reconnaissance Group’s (RF-4Es) with state-of-the-art F-35A and F-35B Lightning IIs. 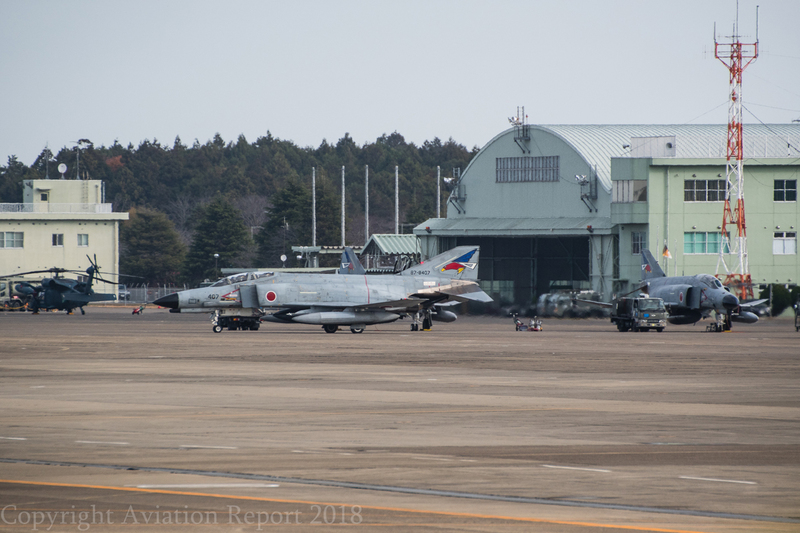 A recent announcement has stated Japan will acquire 100 extra F-35s for a modernised JASDF to counter a growing threat of incursions (said to be almost daily) from China and Russia. 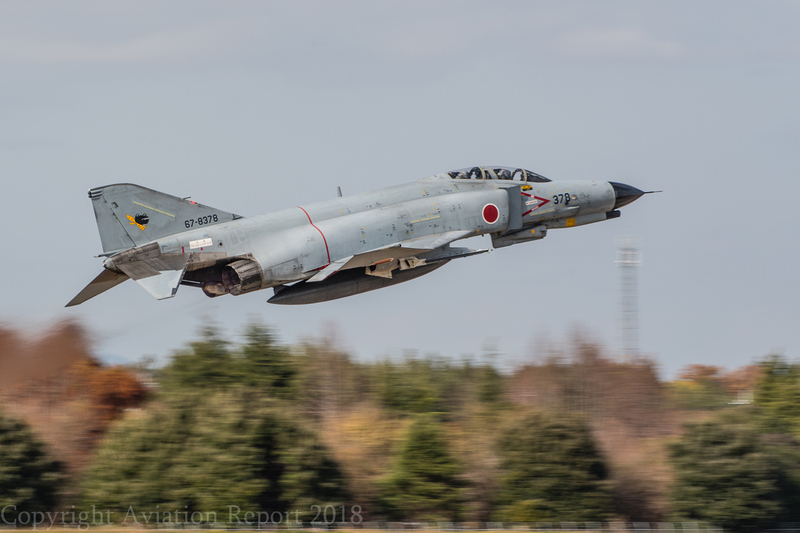 Having admired the Phantom as a type for many years, and enthralled of the variety of variants and schemes, I was determined to visit Japan before the type disappears from the scene. 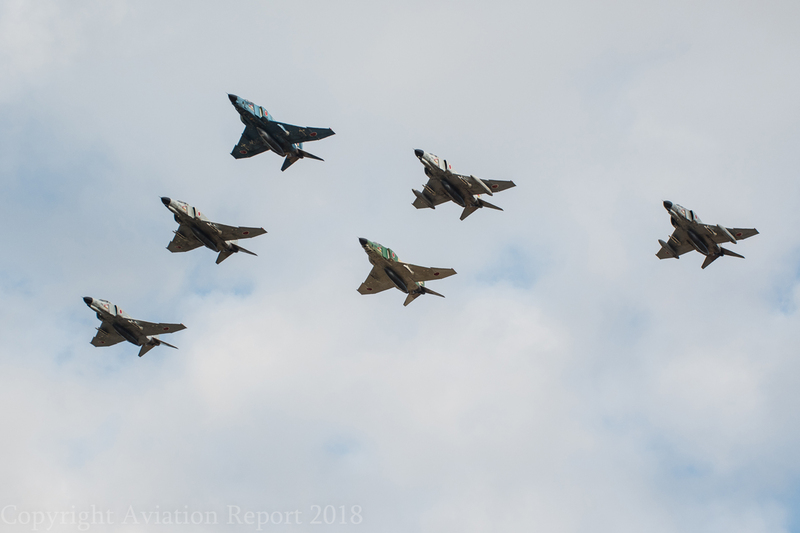 I was particularly keen to photograph the blue and green maritime superiority schemes. 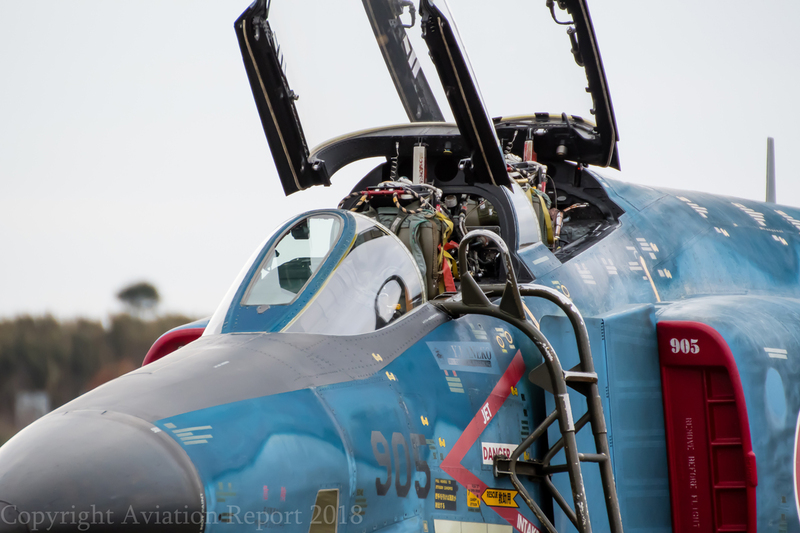 So I joined a tour operated by respected Townsville aviation photographer Leroy Simpson and his wife Maho, and wasn't disappointed. 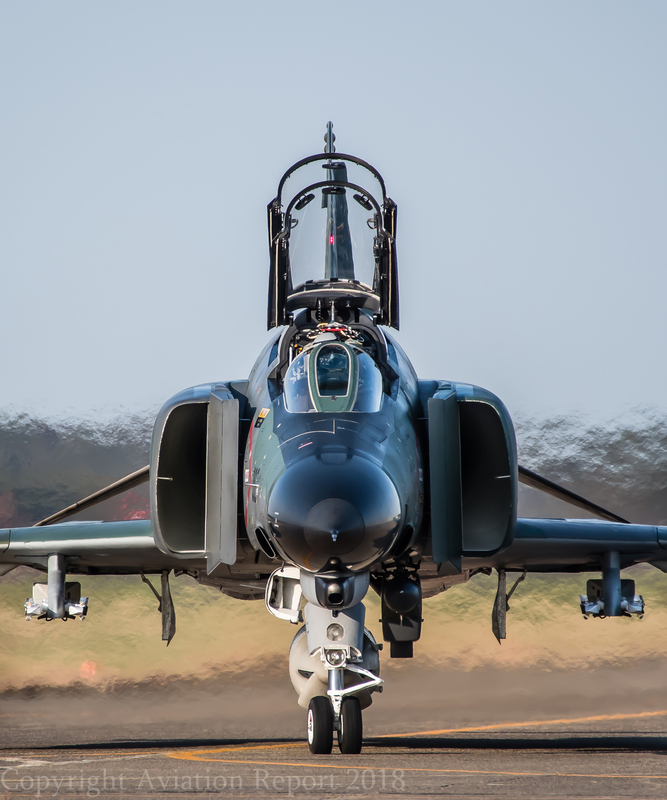 Having a vehicle allowed us the facility to be where the light and the wind allowed the best shots. 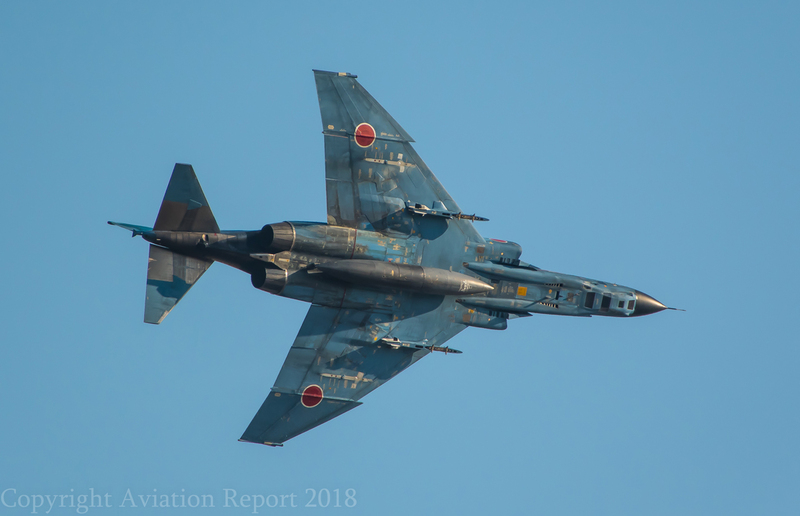 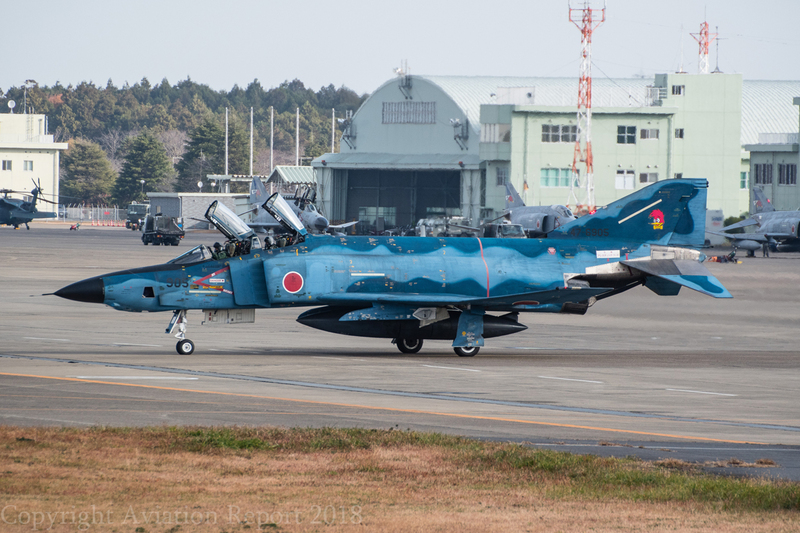 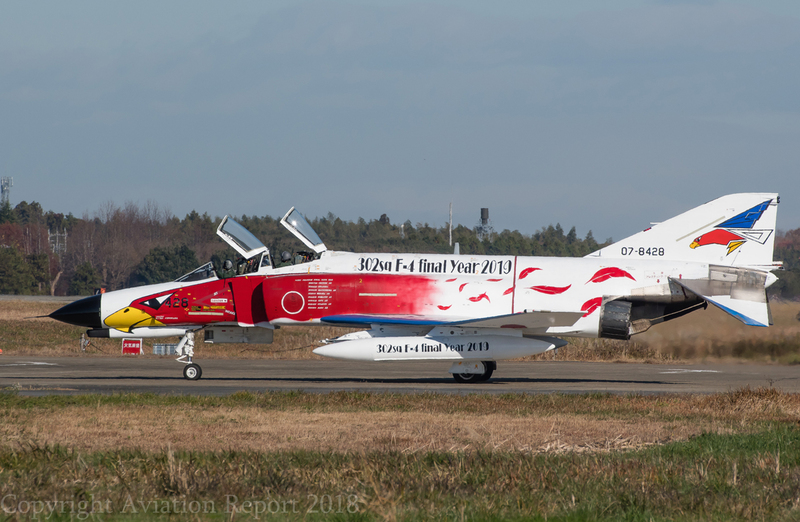 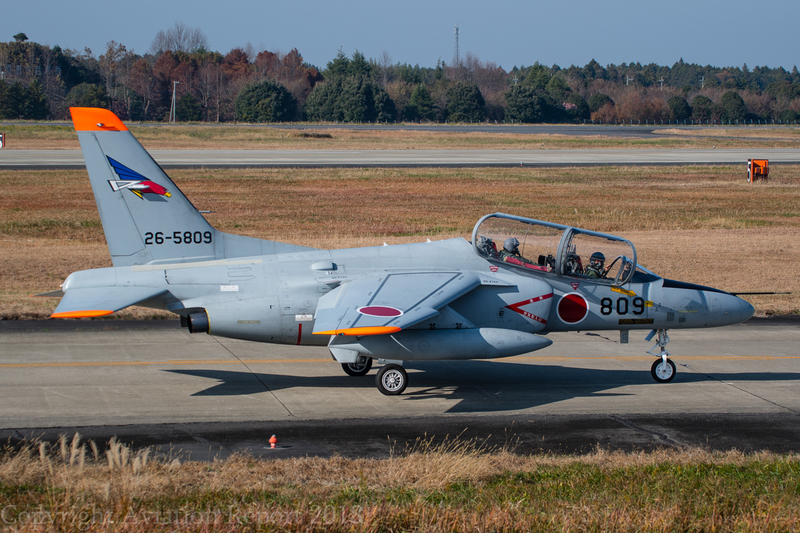 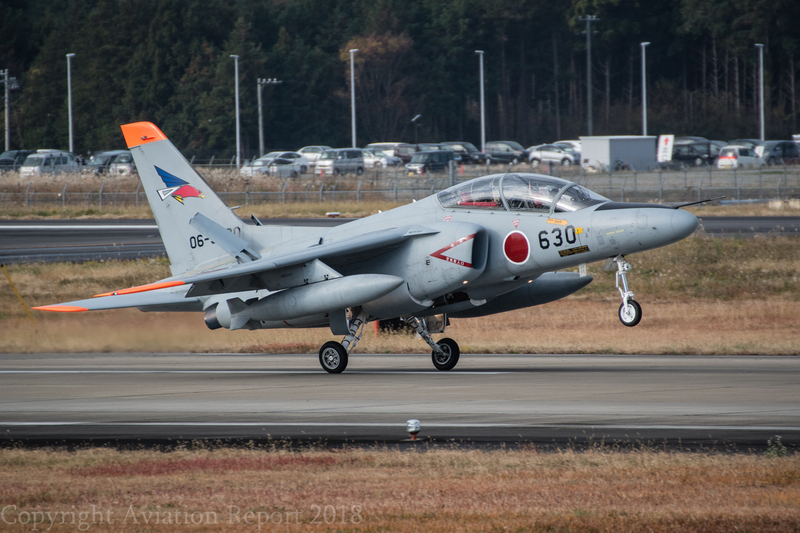 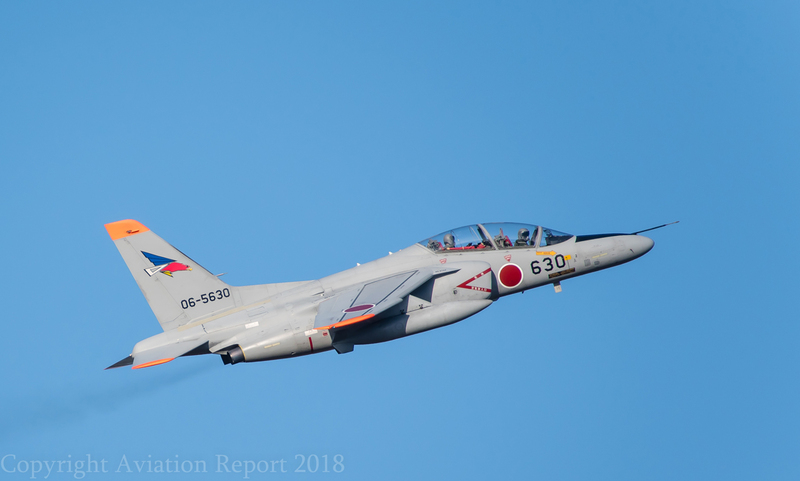 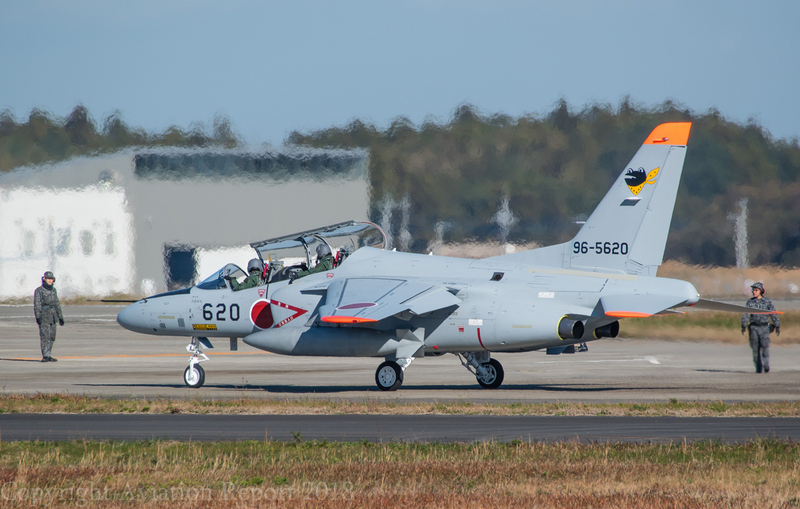 I can only speak well of the JASDF for allowing such ease of access to their bases and indeed, their use of soon-to-be-retired airframes to wear attractive commemorative paint schemes. 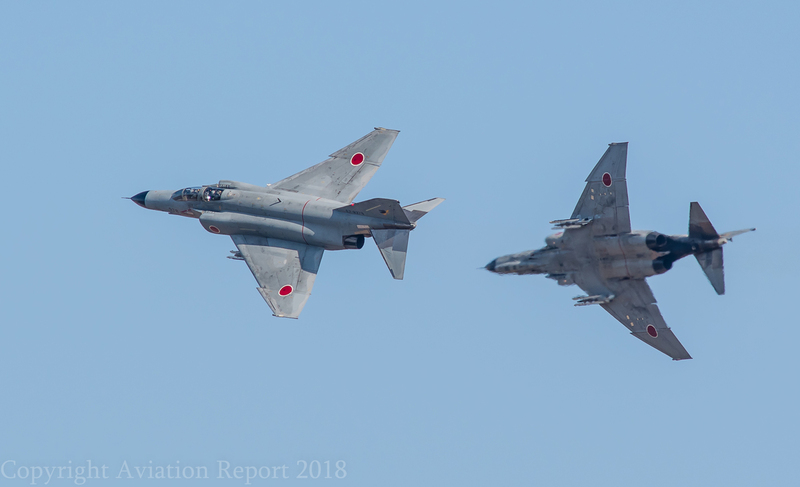 A "peculiarly Japanese" habit is to wave, and it was common to see photographers and crews exchanging friendly and hearty waves on most occasions - all were clearly "living the dream"! 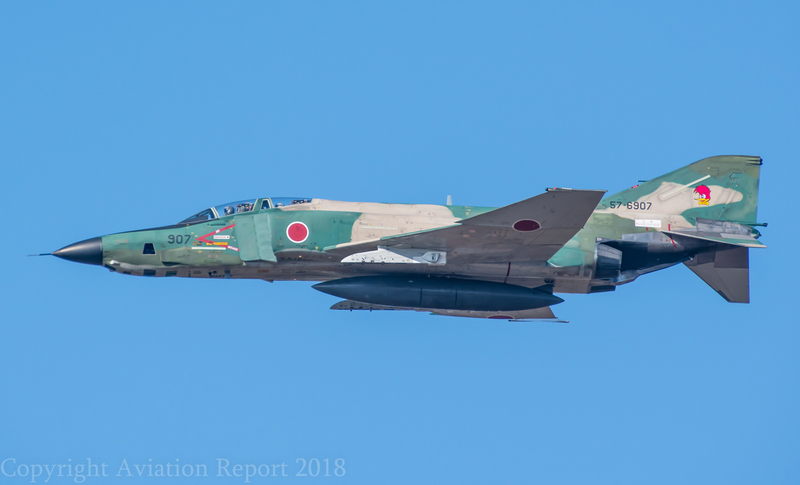 I particularly appreciated the 301st and 302nd flying their low-level attacks and transitions just above tree-top height, with the paired "special" paint-schemed F-4s (the white and the black, launched only that week), repeatedly rolling-in together to strafe" the airfield from end to end. 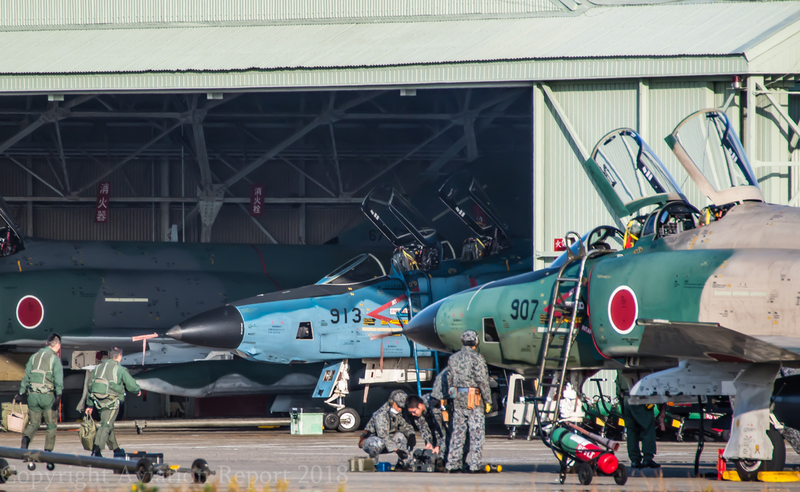 The 302nd painted up these apparently time-expired airframes which is ops-normal for JASDF commemorative paint jobs! 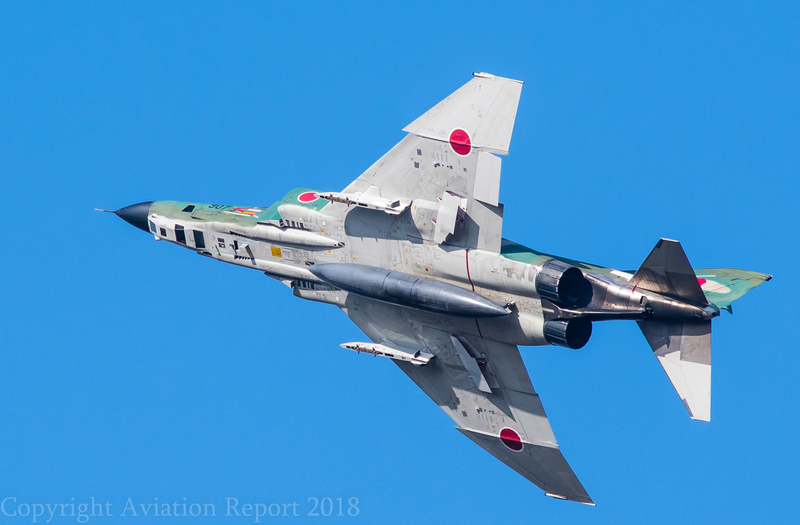 A 301 F-4 did a beautiful solo display as well. 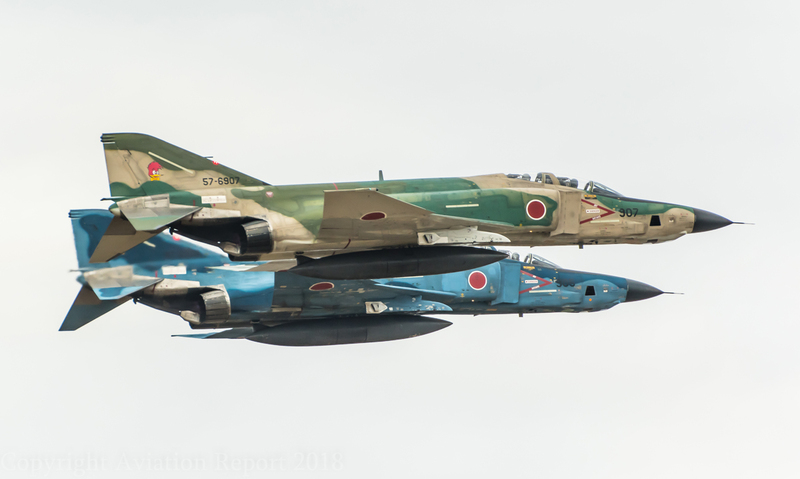 The 501st also attacked, in pairs, providing maximum opportunities to photograph the blue, green-brown and green-grey colour variations. 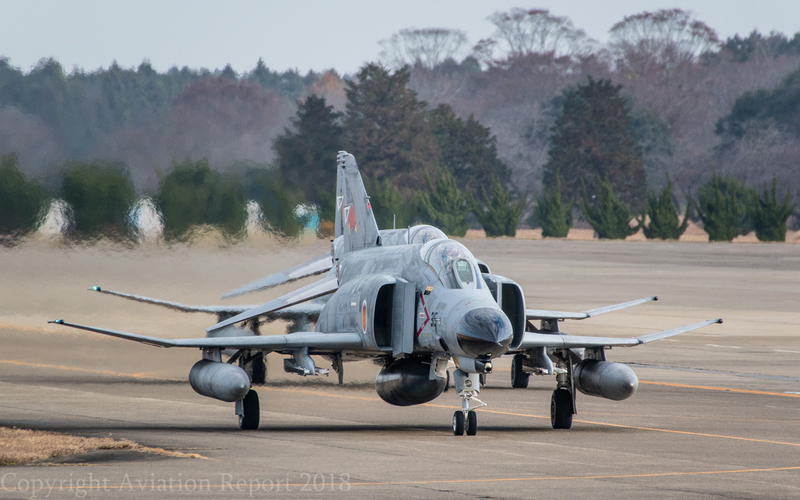 Grey or camo Phantoms several times passed the tower, just over the ramp it seemed. 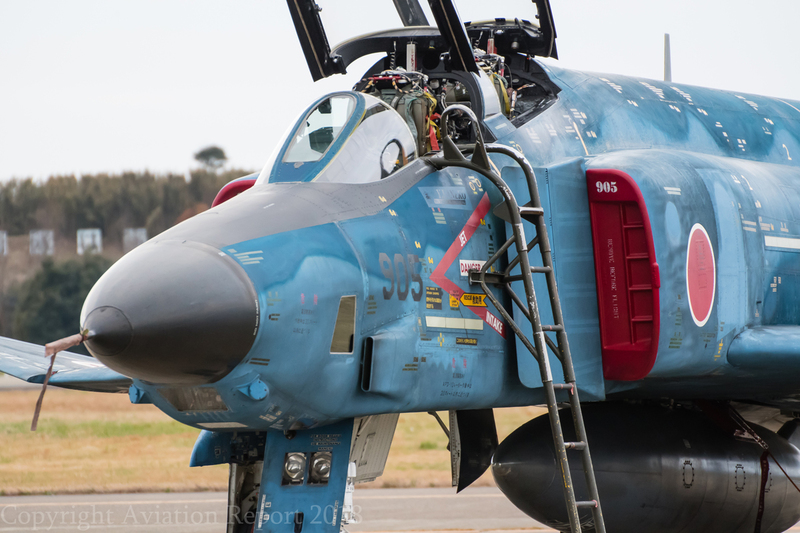 I have not witnessed such concentrated attacks since the final show of the F-111 at RAAF Base Amberley. 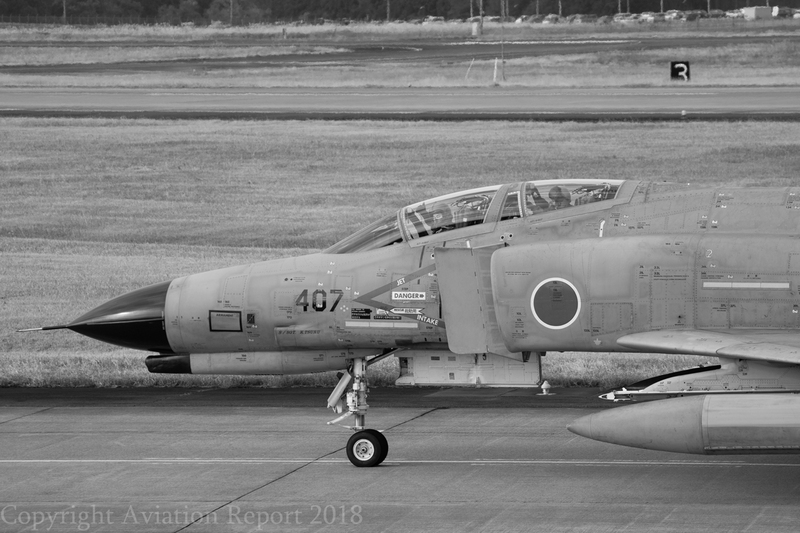 Whilst the weather on the day was far from perfect, as part of the tour we had in fact spent the previous week capturing the "spirit" of the F-4 and took it in our stride. 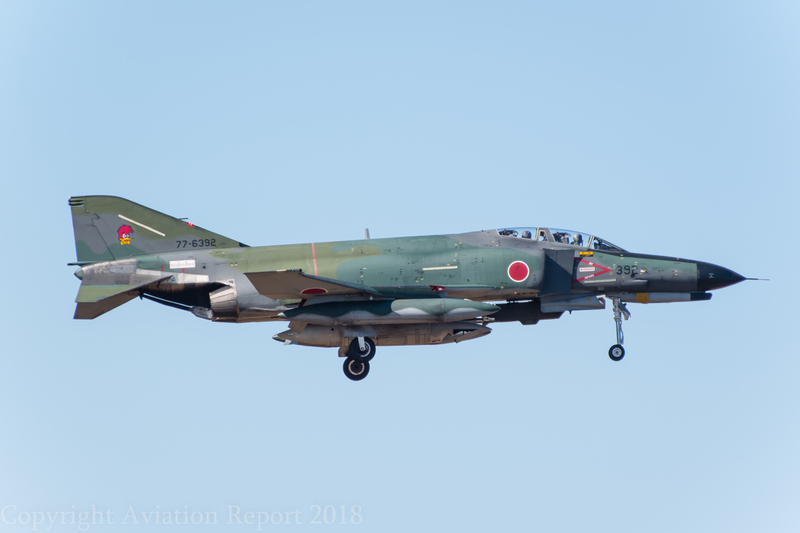 Other significant players included the Air Rescue Wing, Koku Kyunandan Raytheon Hawker 800 (U-125A), heavily modified for SAR and the UH-60J SAR variant, of Hyakuri Kyunantai demonstrating the JASDF's commitment to peaceful humanitarian activities of Search-and-rescue. 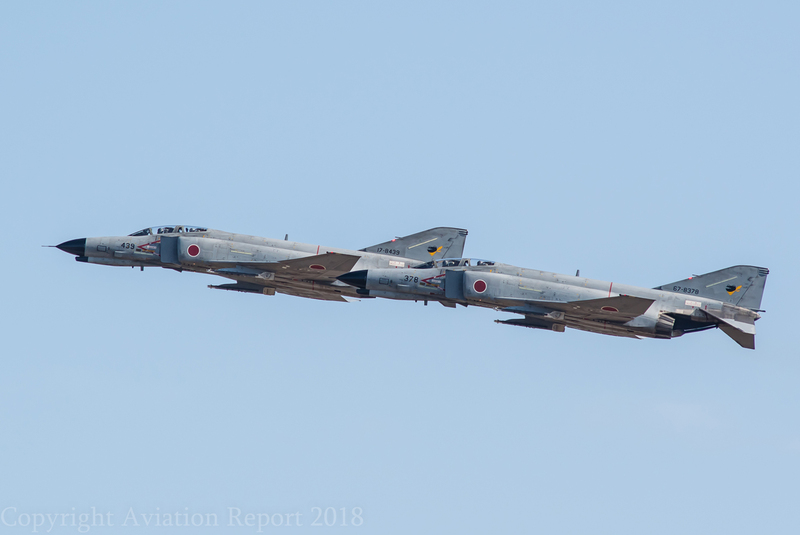 While the -60J dropped pairs of parachutists during the show, the U-125A orbits above, demonstrating co-operation providing swift transit times and top cover for the rescue choppers below. 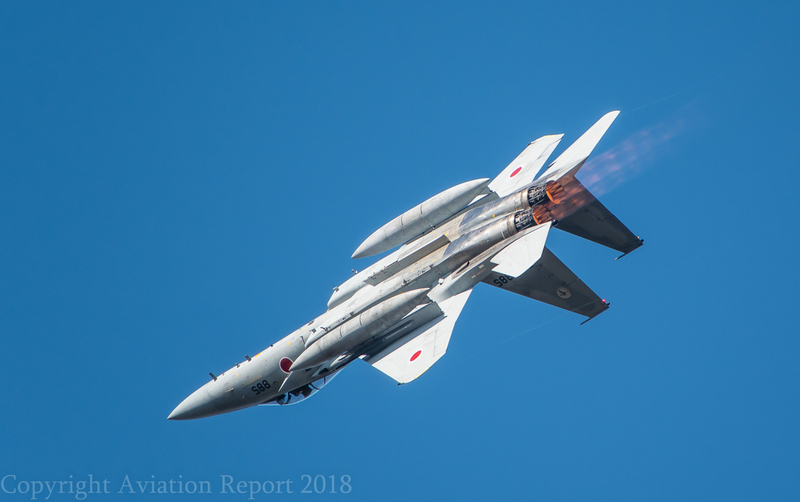 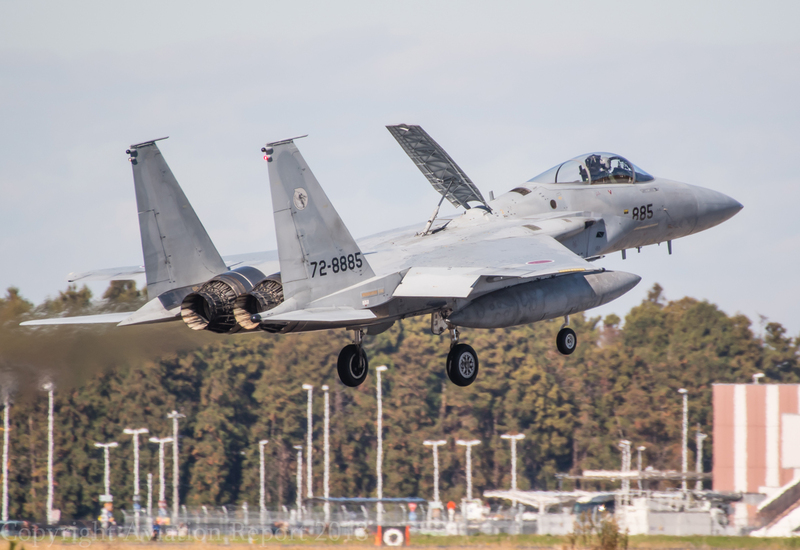 We also enjoyed the best F-15 display (303rd TFS out of Komatsu) I have seen for many years, in beautiful autumn light. 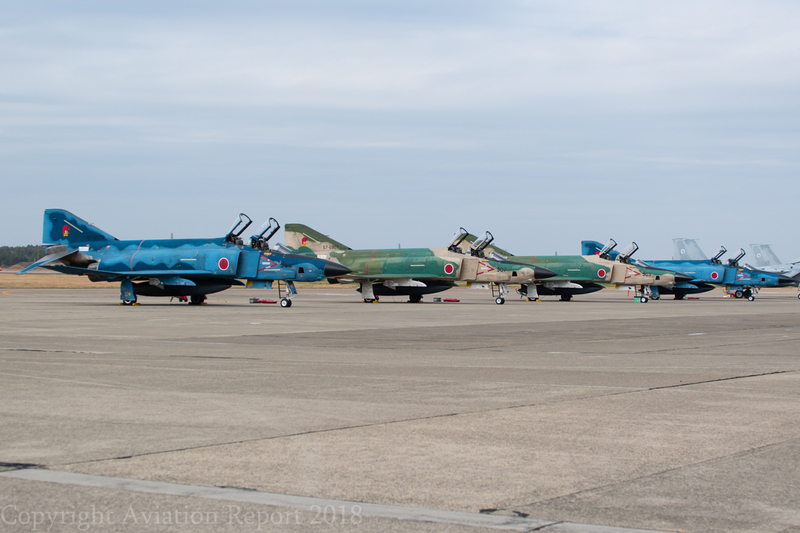 Rounding off the ground displays were a Kawasaki P-1 maritime patrol aircraft, an indigenous F-2 fighter, T-7 trainer (Turbo-Mentor), Bell Huey helo, a Gulfstream U-4, F-15Js and of course, many more F-4s, making one of the best ramps I have ever witnessed.